The meaning of the concept of anticipation escapes the majority of those concerned with change, in particular those who study health. To characterize only genetic disorders, such as conditions with progressively earlier symptoms and higher intensity of disease from generation to generation, in terms of anticipatory expression is rather limited and limiting. Practitioners of medical care could benefit from understanding anticipation as definitory of the living. This view explains why diminished anticipatory expression, in all forms of the living, results in conditions calling for medical attention. So far, medicine has opted for a deterministic-reductionist perspective that reduces the living to a machine. Medical care, stuck in the grey zone between success and failure, should overcome its reactive obsession. From an almost exclusively mechanistic activity, it should evolve into a holistic proactive practice of well-being that reflects awareness of anticipation. A conceptual framework is set forth with the aim of providing guidance in understanding what this study proposes. Anticipation is definitory of the living in the sense that anticipation is expressed at the ontological level of reality, in actual existence. Metabolism, for instance, is such a process. What distinguishes the living from the non-living is anticipation, always expressed in actiondmore precisely, in self-preservation of life (with all that this entails). It is exactly due to the anticipatory nature of the living that on the epistemological level, i.e., in our attempts to describe reality, semiotics becomes possible. It affords the expression of awareness of the dynamics of change. Knowledge about metabolic processes belongs to the epistemological level. Semiotics provides mathematics with representations pertinent to quantitative distinctions. It provides logic with representations pertinent to distinguishing between true and false reasoning. Most important, it facilitates translation of the significant in life processes (such as metabolism) dontological leveldinto meaning, i.e., answers to the “Why?” questions regarding self-preservation of life (to which metabolism contributes)depistemological level. Various understandings of anticipation, going back to Aristotle’s prolepsis (Nadin, 2017a) and extending to our days (Whitehead, Bernstein, Shackle, Rosen, Nadin, etc.) are accounted for, but not reduced to anyone’s particular views. Semiotics, with it very many origins-medical diagnostics among them-is framed in this study within the epistemology of medicine, but never seen as a possible practice of medical care (a position adopted by biosemioticians). It can contribute to the expression, communication, and signification (the three functions of semiotics) of medical knowledge. The National Academy of Medicine made Healthy Longevity its Grand Challenge (2017).1 This happened in the context of the continually increasing average human lifespan. Sanitary engineering, immunization programs, the reduction of the number of accidents are probably as important, if not more so, than successful surgeries (appendectomies come to mind) and the use of antibiotics. Nutrition changed radically. Within the same period, heart conditions, stroke, cancer, and diabetes became more frequent (at least as identified conditions). By 2020-i.e., in less than two years-humankind will be made up of more elderly (65 years of age and older) than the very young (under the age of five years). Medicine has never before been challenged by such dynamics. The majority of those who consider engaging in Precision Medicine, part of the Grand Challenge of the National Academy of Medicine, seek answers in physics and chemistry, in molecular biology, or in computation.2 The latter is practiced in its dominant algorithmic forms, but also in elaborate artificial intelligence (AI) guided activities extending spectacularly to deep learning (a form of extracting knowledge from Big Data). Albeit, this up-to-date practice of medicine is actually dated: it reflects the adoption of a reductionist-deterministic view of biology, going back to Descartes (if not even to medical practitioners prior to him) and the atomistic viewpoint it triggered. The obsession with machines-among which the human being, or anything alive, is but one form of instantiation-is probably its better known version. No one will dispute that physics and physics-based disciplines (such as chemistry) adequately describe the non-living. However, there is a need for a complementary perspective that captures the essence of life: the specific causality characteristic of the living (animals, plants, fungi, insects, microbes, bacteria, etc.). This could be achieved by integrating past, present, and future, not by reducing life to properties of the matter in which the living is embodied. Experimental and empirical knowledge attest that there is no intentionality in the realm covered by physics and physicsassociated disciplines (Brentano, 1995; Fodor, 1987; Papineau, 1987; Searle, 1992; Thau, 2002). In the meanwhile, this understanding (which Laplace suggestively described in The System of the World, 1830) was transcended even in regard to physics phenomena. Quantum mechanics exemplifies the effort to understand dynamics in a more nuanced manner, but still within the past/present sequence. In contradistinction, the living is always characterized by what an observer would describe as goal-oriented behavior-the goal being the self-preservation of life. 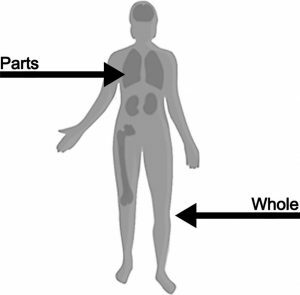 The non-living can be successfully described by inferring from parts (such as the constituent elements of matter) to the whole. The dynamics of the living is holistic. Any reduction results in the loss of significant information about what keeps the whole alive. The distinction between the living and the physical is often rejected, mostly on account of the deterministic view according to which cause (past) and effect (present) are all that is necessary to explain how the living changes-i.e., its dynamics. Nevertheless, observations ranging from anecdotal to systematic recordings concerning how the possible future affects the present of the living, have been accumulated through time immemorial. Classic texts, of philosophic intent at the beginning, later of scientific focus, mainly in medicine, biology, zoology, botany, etc., make reference (directly or indirectly) to anticipatory behavior. Pre-sensing-a process predating sensorial data-was often heralded in the magic and mythical testimony of early human activity, in both Eastern and Western cultures. After magic and mythical testimony, pre-sensing was presented in a variety of writings from authors such as Epicurus, Parmenides, and other natural philosophers. However, until the beginning of the 20th century, few attempts were made to articulate hypotheses regarding the onset of some processes which testified to pre-sensing-not the same as anticipation-and to verify them experimentally. To be clear: the role of the possible future transcends pre-sensing. For the record: in the 1920s and 1930s (and up until the end of the 20th century), a group of Soviet scientists demonstrated their independent thinking-under a regime that imposed deterministic dialectic materialism (as it was called) on them-by highlighting anticipatory behavior pertinent to motoric expression and to cognitive processes. A very important step in defining an alternative to the reaction-grounded understanding was Bernstein’s (1936, 2003) book critical of Pavlov’s reflex theory. He and his colleagues focused particularly on perceptual aspects of anticipatory behavior. Bernstein ascertained that the body is not an action-reaction device, but an entity continuously initiating action from within. It is not guessing or prediction of some stimulus/stimuli, but the active unfolding of life through motoric expression. The work of the Soviet researchers reached (though fragmentarily) their colleagues in the West, but did not trigger any memorable reaction (Nadin, 2015a). The publication of Rosen’s Anticipatory Systems (1985), and Nadin’s Mind e Anticipation and Chaos (1991) further brought the subject into the public domain (but in no relation to “Soviet” contributions). Biology as such shied away from anticipation. With the exception of Elsasser (a physicist trying to provide foundations for a science of the living), and Uexku?ll and associates, few others wrote about it. However, more recent findings in physiology, brain science, and genetics are replete with contributions that document various aspects of anticipation (Nadin, 2010, 2016). For medicine, understanding how anticipatory processes take place-let’s say in the relation between blood pressure and the heart rate-and what the practical implications of this understanding might be is of immediate practical consequence. Immunotherapy, for instance, is an expression of this interest among practitioners of medicine. Another example: the change from targeting sick cells (or other assumed causes of disease) to changing the environment in which they function. Nevertheless, given the machine model that predominantly informs the activity of a large number of physicians, they frequently act more as mechanics of the human body than as nurturers of healing processes. The majority of those active in medical care or in managing it were educated within the tradition of fixing impaired health conditions. For instance, by trying to “kill the bad” instead of understanding what is needed to stimulate healing. Here is where atomistic views, reducing pathologies to states of the matter in which life is embodied, insinuate themselves. Rather than preventing illness, the medicine those atomistic views inspire still address it from a reactive perspective (find the target, aim, firedor replace). Engineering health seems easier than mastering the art and science of healing. Very few, mainly in alternative medicinedwhich the “engineers” frown upondtry to engage the body instead of attacking real or presumed causes through medication (sometimes drastic) and surgery. Neurology, neurosurgery, cancer treatment, gastroenterology, and gene-based therapy are medical endeavors in which the anticipatory perspective is slowly gaining traction. This assessment is based on published articles mainly documenting case studies. Based upon such studies, some simple inferences became possible. For example: the realization that anticipation of stressful situationsdsuch as exams, natural disasters, taxing conditionsdaccelerates cellular aging led some physicians to address behavior and life choices instead of focusing exclusively on the chemistry of stress (and approaching it with more chemistry). Others (such as Sturman and Moghaddam, 2012) took note of the sensitivity of the dorsal striatum (DS) to reward anticipation and focused on prevention (vulnerabilities such as drug addiction). Anticipation of back pain (extremely frequent) seems to predispose to back trouble because anticipatory postural adjustments are affected (Moseley et al., 2004; Story and Berinato, 2014). This example is consonant with Bernstein’s work: the action (postural adjustment) is affected by the anticipation of pain. Neuroticism (the tendency to experience negative emotions) affects brain processing during the expectation of pain. Fibromyalgia is an expression of pain anticipation. The pathophysiology of autism (in infants) or of Alzheimer’s disease evinces the consequences of skewed anticipation (Nadin, 2006). The change of perspective mentioned above (and the few examples to illustrate the thought) justifies the observation that we experience a marked turn from exclusively reactive healing to more frequent attempts at proactive treatment. In the area of brain activity and cognitive functions, there is a broad consensus that anticipation cannot be ignored if we want to make progress in addressing the human being’s changed condition. The action-reaction type of medicine (of “spare parts,” e.g., knee and hip replacements, liver and kidney transplants, and implants of all kinds) is being re-evaluated in view of progress in genetic methods and genetics-based medicine. Open-heart surgery came under special scrutiny due to the fact that, according to the practitioners, it is unnecessary in 70%-90% in most cases, and fails to extend the lives of heart disease sufferers. Dr. Michael Ozner (2010), among other heart specialists (Sidney et al., 2016), advocates preventative measures (anticipatory in nature) through lifestyle changes. Unity Biotechnology, a Silicon Valley start-up, targets senescent cells with the goal of preventing hypertrophy of the heart and chronic in?ammation. Other companies are active in seeking genetic answers to cartilage damage (Hunziker et al., 2015), in order to avoid joint replacement surgery. There is a consensus that the reactive procedure of treating various behavioral problems (attention de?cit disorder, hyperactivity, schizophrenia) through drugs begs to be re-evaluated from the perspective of anticipation (such as proactive treatments that avoid the dangerous side effects of drugs and withdrawal symptoms from them. Against this background, the following will be addressed: 1) the issue of legitimacy-what justifies the anticipatory approach; 2) the specific nature of change in the living (the dynamics of life; 3) the need for conceptual clarity; and 4) specialization and the holistic perspective. Of special interest to redefining medicine from an anticipatory perspective is the understanding of its non-decidable nature (in Gödel’s sense of the concept)-to which a sub-section will be dedicated. Connected to this is the realization that the gold standard of experimental reproducibility, inherent in the dynamics of closed systems (in particular the physical) is not applicable to medicine (Nadin, 2017b) or to any investigation of the living. However, short of simply abandoning what proves to be incompatible with the subject, the scientific community is faced with the urgent need to suggest alternatives for what can be de?ned as non-deterministic processes: the same pharmacological intervention can be useful in some cases, and destructive in others. None of this is exclusionary. The reality of the human body, as the unity of its physical and chemical embodiment and its anticipatory condition, suggests the need to improve upon the integration of reactive mechanical repair jobs, chemical (pharmaceutical) treatment with proactive maintenance and self-healing. These choices will be further analyzed. Medicine is the decisive test of understanding anticipation as definitory of the living. Where life and death are at stake, the philosophical dispute of whether the living is of a condition different from the physical, the chemical, or the informational seems less relevant than the outcome. Therefore, a meaningful test of usefulness is needed: Why study anticipatory processes if they are of no practical consequence in medical practice? It must be emphasized here that the anticipatory perspective is significant also in education, creative endeavors, and political and social forms of interaction. Biology will become the science it aspires to be only when, in addition to its physics and chemistry informed views, such as its atomistic model (supervenience), it will build upon a fundamentally different foundation, irreducible to other disciplines-but not to the exclusion of what they afford for the successful study of life. 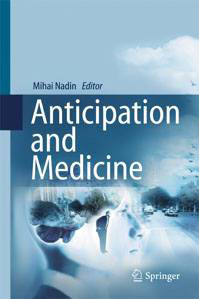 The motivation for the effort to understand various expressions of anticipation can only increase once the notion of “anticipation” itself is well defined (Nadin, 2015b) and understood. Usually confused with other forms of dealing with change-such as forecasting, expectation, guessing, etc., and especially prediction-anticipation is pervasive in all behavior (human, ani- mal, plant). It is existential (see Concept Positing, above)-ontological-not a construct used in acquiring knowledge, not an epistemological artifact. A shared understanding of what the concept is would go a long way in helping the study of anticipatory processes gain traction in the medical community (or other communities of shared interests). Conceptual clarity, more than instrumental or pharmacological obsession (so typical of this particular time) is a necessary premise. In the section “Conceptual Clarity,” a formal definition will be provided. The conceptual path to the definition traverses the rich territory of empirical evidence for anticipatory processes. From Galileo to Newton, and from Newton to Einstein, and probably from him to the quantum mechanics scientists, there is a convincing progression in understanding laws of physics. The legitimacy of each subsequent theory reflects the degree to which the understanding of reality becomes wider and deeper. The fact that human dedication to understanding the changing world, within which the living unfolds, will eventually crystalize in revolutionary views is in itself worth celebrating. But it invites re?ection as well. Nothing comparable, not even the famous DNA helix, is on record in explaining life itself. Newton, Einstein, the quantum mechanics visionaries (Heisenberg, Schrödinger, Bohr, Feynman, among others) are present-and rightly sodin the explanation of the beginnings of the universe. But the beginning of life is still in the fog of confusion (or speculation). Almost as seductive as alchemy was long ago, the attempts to start life from non-life, as well as the attempts to create a non-dying human being,5 take new manifestations. We experience a rather disconcerting surrender celebrated as victory: since the living itself is embodied in matter, the more physics we know-and the more physics-based biology we use-the better we will understand life and extend it as we wish. The obsession of particle physics (i.e., know the particles and you will know all about what they make up) translated into the hope that molecular biology or genetics will solve all the mysteries of disease and eventually of life. But the four fundamental forces of physics-gravitational, electromagnetic, strong, and weak-still do not explain the change from a condition of health (as ambiguous as the term can be) to one of deterioration. Of course, as constructs pertinent to describing the dynamics of reality, they were not meant to specifically explain illness. Given the current infatuation with information and programs, the jargon of genetics-borrowing from computer science-is at the forefront of medicine today. Obviously, there is much more nuance to all of this. To rehash the arguments of every controversy, including the ill-fated vitalism, will not change the substance of the observation. So far, life science consists of adopting (or adapting) physics theories and their extension into particular phenomena (biochemistry, for instance). A large body of generalizations from the physical to the domain of the living extends this physico-chemical-based science into the obvious antagonist of vitalism: the living machine. Let’s be clear: while the material substratum is acknowledged without reserva- tion, the dynamics of the physical and of the living are different. The distinct effort to advance a view of the living that defines its own characteristic causality has serious consequences in the practice of healing. Therefore, to integrate the science of the physical and that of living processes, without discarding what defines a science of the living is of extreme urgency. In doing so, we might even come to the realization that physical causality (explaining change in the non- living) is a subset of extremely rich types of causality that explain the change of life (Nadin, 2015c). The daunting task of distinguishing between change in the living and the non-living, requires that the focus should be on dynamics, which means how and why change takes place, as well as the rate at which change takes place. The matter from which physical entities (not endowed with life) are made remains the same. The “oldest oxygen oasis” was just discovered in rock layers 2.5 billion years old.6 The living is in a continuous state of remaking itself, sui generis re-creation of its constitutive cells. Empirical evidence suggests that change in the non-living realm takes place at a timescale different from the multiple timescales characteristic of living processes. (Even the aggregate defined as the human body functions at several different timescales.) Scientists determined the age of sand and the composition of the boulders from which it was processed. Scientists also recreate from DNA samples the organisms from their fossil remains. Moreover, in the physical, the timescale is relatively constant, while in the living it varies under the influence of context. There is no birth and no death (short of misappropriated metaphors applied to stars and black holes) in the physical. And there is, contrary to poetic license, no intentionality either to be observed or experimentally documented. “Evolution itself also evolves” (a quote from Nobel and Noble, 2017, pertaining to Noble et al., 2014) describes iterative interactions between organisms and the environment. The realization that physical causality could be a subset of natural causality might entail the need to understand Nature beyond Newton’s unifying view. He famously aggregates the living and the physical and declares the laws of physicsdre?ecting God’s control over the universedas universal. Darwin’s Origin of Species (1859), while eliminating God from the picture, was celebrated as the equivalent of Newton’s foundation of physics (Philosophiae Natu- ralis Principia Mathematica, 1687). Natural selection describes the implicit dynamics of the living, of a precision different from that of the physics of gravity. Evolution’s causalities (the plural is intentional) are different from the causality described in Newton’s equations, in Einstein’s relativity theory, or in the stochastics of quantum mechanics. Determinism, the characteristic causality of physical phenomena, is convincingly relevant to a subset of the physics and chem- istry of the living. But it returns an incomplete explanation of the changing living. Empirical evidence: physical forces (e.g., pulls, compressions and stretching, distortions) applied to a cell can further affect it, probably more than the inherited genetic code does (Picollo, 2013a; 2013b). Taking both physical forces and the genetic code into consideration affords an understanding of cell changes that neither can deliver alone. Non-determinism, describing a relation between cause and effect that takes the form of a multitude of possible outcomes, pertains to change as an expression of something being alive. Indeed, changes due to physical forces applied on cells (think about hitting your thumb with a hammer, cutting yourself with a sharp knife, or falling against a rock) and genetic processes governing all dynamics are interwoven. There is no way to unequivocally predict whether a cell becomes cancerous or simply divides in a process of self-healing. This example is also illustrative of what is defined as the bottom- up (from matter) and top-down (from the cognitive) integration of causes (Auletta et al., 2008) in the dynamics of the living. Due to the trade-school model of training physicians, medical practitioners end up taking the machine metaphor literally. This metaphor, to which science beyond the age of de la Mettrie is literally enslaved, is but one consequence of a rudimentary view of causality. Only recently, that is, after the advent of quantum mechanics, was this view somehow questioned. Stochastic aspects of dynamics were introduced, and indeterminacy accepted as a qualifier for processes less than very precise. Uncertainty, which Heisenberg formulated in opposition to Laplace’s expectation of complete determinism, and the machine understanding of the being are incompatible. Everything that can be fitted to the time series describing a machine’s functioning operates in the expectation of perfect repetition. However, the living is the domain of “repetition without repetition (Bernstein, 1967; Ito, 2015), i.e., non-monotonic change. This applies as well to evolution as to the anticipatory motoric expression in humans and animals, as well as to genetic expression. The urgency of the task of bringing this awareness into the culture at large, and in particular into the world view of medical practitioners, cannot be emphasized enough. To know how the physical changes is to infer from a quantitatively described past state to a future state, under assumptions usually defined as initial conditions (also expressed numerically). To know how the living changes requires more than the physics-based description. An adequate explanation of change in the living requires integration of inferences from past states with interpretations of the meaning of possible future states. No falling stone will get hurt (not to say die); a living falling (bird, dog, bear, human being) can get hurt (and even die). A bone fracture is a physical phenomenon pertinent to strong forces. However, the pain and the resulting changed behavior (motoric expression) are not reducible to the physical. Various processes associated with the fracture, including the physiology of self-healing, evince anticipation. The framing of change within the respective consequences, different in the physical and the living, is key to understanding their difference. The causality specific to interactions in the physical realm is described in Newtonian laws-action-reaction, in particular-and was further refined in relativity theory. It was extended in the quantum mechanics and molecular biochemistry, for the micro-level of matter. The causality specific to interactions in the living includes, in addition to what chemistry and the laws of physics describe quantitatively, the realization of significance in connection to the possible future. The physics or the chemistry (or both) of some processes can be the same, while the outcomes for the same individual, or for different individuals, can greatly differ. The metabolism (of proteins, of sodium and potassium, of sugars, etc.) characteristic of the living, which physicians are aware of, makes this point quite clear. The physics of an explosion has consequences for the bricks of a house (and all that makes up the built structure). These material consequences are different in nature from the many additional consequences for the inhabitants (tenants with a lease, or co-tenants, such as the cat, the dog and everything else alive, such as mold and vermin) living there. The medical practitioner would have it easy if after an explosion all there was to fix were broken windows and walls, pipes and amenities. The Hiroshima and Nagasaki experiences fully document the statementdthe “rebuilding,” the natural re-creation (what Rosen described as repair and self-repair, 1972a) is spectacular. The human tragedy (death, suffering, mental torment, etc.) could not be reversed through fixing. The recovery of the environment around Chernobyl after the explosion of a nuclear power plant is testimony to living processes more powerful than the disaster: survival, preservation of life under extremely adverse conditions. The consequences for the physical aspect-destroyed buildings and machinery-are finite, and almost always immediate. The impact on the condition of the beings affected is open-ended. It can take quite a while for some of the consequences to even become apparent. The classical physics of momentum and energy conservation applies, of course, to the collision between a wide receiver and a defender in football. But the concussions go well beyond the physics. The anterior cruciate ligament can withstand 500 pounds of pressure, but it tears from side hits of lesser intensity. Brain damage is even more telling of what transcends the physics of collisions. Verbal ability, memory, spatial orientation, and balancedall affecteddare not physical in nature (Vedantam, 2011). The fact that the living, in addition to the constraints of physics, is subject to contingent rules of behavior is usually brushed aside. Reductionism postulates the identity of the physical and of living, to the detriment of a better understanding of the dynamics of the living. The same applies to the epistemology developed around the machine metaphor. Karl Popper (1972, p. 224) remarked that, “… the doctrine that man is a machine has perhaps more defenders than before among physicists, biologists, and philosophers, especially in the form of the thesis that man is a computer.” Newell and Simon (1972) went further: “Men and computers are merely two different species of a more abstract genus call information processing systems.” The fact that computers process data, regardless of meaning, and the human being interprets information, that is, data associated with meaning, has escaped their sharp thinking. Unfortunately, almost 60 years later, the views they described have not changed. Machines, regardless what kind (from clocks to hydraulic pumps, to engines, to computers, i.e., programs), are constructs meant to function in a predictable manner, and always in a repetitive manner. Religion postulated that the human being was created in the image of the Creator. Machinomorphismdthe hardware machine as much as the soft machines of our timedestablishes the secular religion of human beings made to function like the machines they conceived (Fig. 1). It is a solipsistic view: the making of something (e.g., machine) is the proof of the equivalence between the makers and the made. For Newton, the mechanism of the universe, whose dynamics are precisely described in his equations, was the proof that everything in this universe behaved, at God’s will, like a mechanism. The medicine it inspired pursues the goal of fixing malfunctioning mechanisms. If the clouds (Popper’s metaphor) “are highly irregular, disorderly, and more or less unpredictable”-examples are molecules in a gas, or gnats-clocks are precise and predictable. Still, for determinists (regardless of their “color,”, from Laplace to quantum indeterminacy) clouds are clocks. In their view, with enough knowledge, what appears as indeterminate proves to be as determinate (matter of degree) as the universe, or as the structure of matter. That the clocks in the living have a variable rhythm means a lot to the organism, but not enough to scientists of a reductionist bent. In science, the language describing the functioning of clocks (and of machines in general) is mathematics built upon the construct we call numbers, which ultimately label quantity (unless they are used as symbolic identifiers, such as in Social Security numbers, or in defining a street address). The automation of mathematics (or at least part of it) through computation gave this tendency a new, more specific, though ultimately illusory, viability. And while doctors did not adopt the language of mathematics (most of them are mathematically adverse, if not inept), they happily make use of “mathematical machines” (i.e., computers). For them, the chemistry and the physics of blood pressure, metabolism, or kidney functioning is delivered from a laboratory where a database serves as a reference for qualifying some numbers as too high and others as too low (the game of ranges). There is a lot of detail (sometimes confusing, as in the PSA7 value), but the sense of the whole is lost. The individual is reduced to a matrix. Fig. 1. 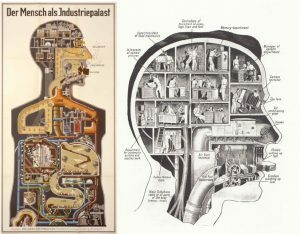 Fritz Kahn (1926): graphic analogy between anatomy and machinery visualization of the digestive and respiratory system as “industrial palace,” really a chemical plan; visualization of minddas yet another mechanistic image. Today the metaphors would be more in line with data-processing machines and methods. Machines (hard or soft) embody the cognitive construct of numbers, i.e., representations of quantities, or symbolic representations (such as the infamous numbers tattooed on the arms of concentration camp victims). As representations of the human activity that the machine replaces or augments, they are, by their condition, incomplete (Nadin, 2014). To ascertain that a representation-the machine (Fig. 1) disidentical to the represented makes sense only for entities with clear boundaries. A billiard machine is equivalent to a billiard table in which, given the initial and boundary conditions of the billiard balls, the characteristics of the table (size, texture), we can, using the laws of motion, “calculate” the game. Laplace (already referred to) was sure that given the positions and the momenta of all particles in the universe, he could, using Newton’s laws, fully describe the past, present, and future of the universe. Today, the model is also applied to “calculate,” for instance, the outcome of football games (a “machinery” in which each player is identified through his weight, speed, etc.). The universe as a clock, i.e., a machine, is what physics-based determinism ascertains. Evidence from experiments confirmed Einstein’s view that clocks positioned higher above the Earth run faster. Modern navigation systems (using satellites with clocks operating a high altitude) reflect this knowledge. But to infer from this that the twin brother living at the summit of the Himalayas would age faster-a biological, not a physical, phenomenon-than the brother living at sea level is quite telling of what goes wrong when we generalize from clocks to life. The famous dispute between Einstein and Bergson (Paris, April 16, 1922) on this matter is still waiting for a more comprehensive examination (Canales, 2016). The universe as a computer (the outcome of which is presumably our reality8) is only one step further in the same direction. When some doctors talk about “reprogramming” patients, they actually disclose the angle from which they consider health. It is therefore not surprising that the debates of our days around the issue of longevity extend to the claim that “our bodies are information processing systems” (Geddes, 2016). Vijg and Campisi, (2008) maintains that we are “essentially a computer made up of overwritable data and updatable apps” (Friend, 2017, p. 66). Neither is it surprising that almost every surgeon educated in the medical “school of determinism” is prepared to provide “spare parts” when needed. Others of the same school are all set to perform genetic reprogramming (for which CRISPR technology for genetic editing was invented) for eradicating Lyme disease (Esvelt, 2014; Specter, 2017) without fully understanding the intricate nature of technology. Of course, they know that, at least under current circumstances, a pump is not really the same as a heart, and a genetically reprogrammed organ can fail or induce other major changes. For extreme conditions-entailing a number of serious limitations-a pump might be used in order to help resuscitate someone, or extend someone’s lifedusually in an impaired mode. This is where the mechanistic dimension of medicine is important. Genetic reprogramming, of which the majority of scientists are still reticent, might eventually help in extreme cases, but before deploying it, we need to ask questions about the shortand longterm consequences for the whole to which the preprogrammed parts belong. In other words, we need to account for anticipation, the possible future life of patients. Actually, not only isn’t Laplace’s deterministic view inadequate for describing life, but worse, it leads to aberrations. As spectacular as body part replacements are (and quite often a “life-saving” intervention), they “fix,” but do not heal a condition. Moreover, they lead to long-term consequences, which humankind is not yet able to ascertain. The fact that biology, and medicine in particular, made the deterministic view into their religion is understandable. Explaining away what we don’t fully grasp is easier than assuming the responsibility for seeking alternatives. Simpler explanations afford the immediacy of practical methods, sometimes informed more by urgency than by anything else. The fact that the education of medical practitioners, at all levels, has to change in order to reflect the state of the art in science-knowledge of anticipatory processes, in particular-is self-evident. Medical education cannot continue to uncritically follow the path of which medical education was imparted in the last 50 years. It will have to open up to the dimension of anticipation definitory of the living. The training of those who assist physicians (the technicians who know better than the doctors how machines are used) will also have to be conceived on the premises of a new medicine. The anticipation aspect is not one ingredient among others, but a fundamentally new perspective: a new Cartesian revolution (Nadin, 1999). It is not as comfortable as the successful beaten path of physics (and chemistry) and its promise for technology. It took over 200 years (more precisely, since Newton, Descartes, Laplace) to realize that the question of what change means in the living elicits a foundation different from the Cartesian view of the world. Therefore, one cannot expect abrupt abandonment of the huge investment (time, energy, money, human lives, and the lives of animals used in experiments) made in taking the wrong turn. In the context of rapid scientific advances and disruptive modes, we can hope for a shorter time for ascertaining a complementary view. The urgency of applying it to situations for which physicsand chemistry-based medicine is not adequate cannot be over emphasized. The aging of the world population is unavoidable; the degeneration of the speciesdexpressed in, among other ways, systemic disorders and debilitating spectrum conditions resulting from the mechanistic views still dominating medical practiced is probably an even more critical aspect. science of medicine are facing a major choice: to continue exclusively in the mechanics of health, or to overcome the limitations inherent in generalizing physics (and the notion of machine) and chemistry in the living domain. The disruption brought about by the awareness of anticipation is not an abstract choice, but a survival necessity. The scaling of medical concernsdsome outcome of the current reactive practice of medicinedsuggests that the choice mentioned is inevitable. If indeed climate change is no longer a matter of passive acceptance but requires everyone’s action, so does the need to redirect medicine along the path of anticipation characteristic of the living, not by excluding the appropriate “mechanics” of a deterministically driven perspective of health, but by integrating the two as the context requires. It should be noted that other definitions (Rosen, 1974, Louie, 2017, among others) display a more deterministic bent: they bring in predictive aspects, for example (the predicting model unfolding in faster than real time), which are different in nature from anticipation. Prediction is a construct; anticipation is embodied in action. At the ontological level there are no predictions. It can even be formulated as: the state of the matter in which the living is embodied defines its condition. Experiments with decerebrated animals (from the classic frog to other species) evince what is wrong with such a limiting model. Pflüger (1853, Clarac, 2005) demonstrated that decapitated frogs evince not only reflexes, but also intentional behavior. (For more examples see Musienko et al., 2015). The diagram (Fig. 3) corresponding to this definition does not allow for considerations of the future, except as speculative inferences. Fig. 2. Anticipatory process: the deterministic time arrow from past cause to present and future effect and the complementary time arrow from a possible future. Both affect the system’s current state. Fig. 3. The physics-based deterministic view: present determined only by past. A “cause” was not taken as a whole situation, which at a certain stage insensibly passes into another situation, called the effect …. Everything between this cause and this effect was blotted out …. We have to return to the fluidity plasticity of nature and experience. The whole image, with its richness of detail, is what actually explains the life we experience, life in general, ours or that of the rest of nature. The reductionist view excludes the consideration of vagueness. Just as an illustration, a clinical description of a condition such as hepatitis evinces vagueness in the clinical ascertainment: total proteins are usually normal, albumin is decreased, etc., with qualifiers such as “slightly” or “moderately” applied to increased d (gamma) globulins or decreased a (alpha) and b (beta) globulins. Degrees of possibility (possible future) in respect to symptoms and disease (itself not always well defined) are not only a language feature (for which fuzzy sets can be deployed), but also an expression of anticipation awareness. Medicine is often a matter of perception for the patient as well as for the medical team (doctors, nurses, assistants). Impossible to ignore in this case is the role of the placebo (Hoffmeyer (1997), p. 92; and more recently Goli, 2016). One headline reads “Why Fake Operations Are a Good Thing,” (Wallis, 2018, p. 21) and refers to interventions in which nothing was done (placebosurgery), but the patient felt better afterwards (expectation as a healing factor). Perception, sometimes skewed, triggers anticipatory processesdusually as defense processes, but also as reward outcomes. The onset of schizophrenia, bipolarism, or eating disorders is not infrequently associated with adolescence. Vulnerabilities associated with adolescence can be addressed proactively, through dietary interventions and cultural inclusion, for example, thus avoiding the dangerous path of palliative medication. At their physical highpoint, and with a brain experiencing higher synapse density (plus changes in myelin), adolescents can give way to extreme behaviors (including a large occurrence of suicide, as the World Health Organization9 reported). In the absence of a proactive practice of medicine, we end up with ADHD and the “idiotizing” pharmacology attached to it. Drug addiction, obesity, depression-the third leading cause of disease among adolescents-and violent behavior beg for an anticipatory view and the associated means for prevention. Suicide, shootings in schools and on university campuses, even the willingness to become warriors (including terrorism) are related to the subset we brought up here. Reactive medicine is reductionist: replace the used (probably when pain is considered as the threshold), defective part and everything else will run fine. Or target and kill some diseased cell(s). The anticipation perspective ascertains interconnectedness: every component of the living participates in its expression (as healthy or not). Indeed, health, and well as loss of it, is the expression of the whole called human being, including the biome shadowing it, and the spiritual expression of the non-physical state (consciousness, preparedness, self-control, etc.). Affecting as little as one cell’s condition, or that of the viruses, microbes, and bacteria making up the biome, might, under certain circumstances, trigger a multiplicity of processes, some of extreme consequences, others of episodic nature. For the sake of the argument, let’s take Methicillin-Resistant Staphylococcus aureus e (MRSA). MRSA, caused by the staph bacterium, can affect people who have spent time in the “health factories” (e.g., hospitals, nursing homes), or at “health shops” (e.g., dialysis centers). Invasive procedures, such as surgery, intravenous tubing, knee and hip replacements, and implants can give rise to infections that prove to be resistant to antibiotic treatment. The fact that medical treatment, successful in most cases, kills more people than various medical conditions experienced over a lifetime is by now accepted as an inevitable curse. It is actually one of the consequences of ignoring holismdthe unity between all elements (patient, physician, medical equipment, hospital, etc.). Physicochemical-based devices of all kinds also get “infected” or “sick,” that is, they malfunction (or can be maliciously hacked). But the rate of success in fixing machines is as high as it can get, while the success rate of healing is increasing only slightly. The spectacular successes of extremely complicated cases (usually reported by the media) are rather the exception. The idea that medicine’s fundamental perspective might be deficient has not led practitioners to question it, and has not resulted in a vigorous attempt to complement it with an anticipation component. Reward medical practitioners for stepping out of the comfort zone within which they operate (seeking the “common denominator” for which there is a known cure). Medical practitioners dedicated to research of anticipatory processes pertinent to health will have to deliver operational means and methods that their colleagues in healthcare can use. Move the liability focus from the physician to the “industry” (pharmaceutical, testing equipment, production of replacement parts, etc.). These are necessary, but not sufficient, conditions. Only if all prerequisites are met will medicine change. Otherwise, it will take a deeper crisis than the current one before medicine progresses from reaction-driven physics-based practice (“fixing” the patient) to a proactive, anticipation-based dedication to the well-being of the whole person. The most recent data from a compensation survey (Medscape Physician Compensation Report, Grisham, 2017) confirms that practitioners of reaction-driven medicine are rewarded with income levels double of what those working in pediatrics, internal medicine, geriatric care, endocrinology, or immunology. Excising basal cell carcinomasdthe target and kill modeld performing heart surgery, replacing knees and shoulders involve elaborate (and costly) technology and procedures for immediate (more or less) remedy. Telling of what the public is willing to pay for, cosmetic surgery rates almost as high as heart and orthopedic surgery. In contrast, pediatric care and geriatrics are different not only in the scale of reward, but also in the expectation of outcome. Each must engage the individual in the process, enlisting the patient’s own anticipatory resources in healing and sustaining health. In submitting such an evaluation to the community of scientists-especially those in the medical field and those behind them, pushing their wares-we risk antagonizing a very powerful segment of the economy. Eisenhower warned against the militaryindustrial complex (MIC) and its influence on public policy. It was probably justified to acknowledge its pendant, the medicalindustrial complex (pharmaceuticals, physicians, hospitals, insurance, etc.). The medicaleindustrial complex is the network of corporations which supply health care services and products for a profit. The term is analogous to “military-industrial complex” and builds from the social precedent of discussion on that concept (Ehrenreich and Ehrenreich, 1971). In the last 10-12 years, all initiatives in the healthcare domain-always a matter of governmentdwere no more than the expressions of interests remote from the mission of medical care. Germany and France socialized medical care. The USA with its mediocre medical care (the most expensive in the world, but ranked as 35th in terms of its effectiveness), still does not find ways to emancipate itself from the medical-industrial complex and to live up to the social exigencies associated with healthcare. The solutions advanced by political parties (captive not only to the “Big Pharma” lobbyists) and the government serve neither patient nor physician. Ignoring the stakeholders, public healthcare policy driven by the reactive model of medicine is actually detrimental to society. For the sake of clarity: these ascertainments regarding medical care in the USA also concern the way medicine is practiced in most countries of the world. The broader subject of the economy of medicine (and its fixation with profit-making regardless of the quality of service) is also a matter of anticipation. But to discuss it here would open a subject for which a much larger discussion, extending to politics, cannot be avoided. A computer-driven car can be fixed while it is running. A patient is most of the time under narcosis during surgery, and subject to pain-killing drugs afterwards (sometimes for quite a while). These simple facts (related to a classic joke about the difference between a doctor and a mechanic) are illustrative of the mentality aspect of healthcaredthe second most important branch of the USA economy (if not already the first) in terms of the number of people employed and the contribution to the gross domestic product (GDP). Car owners are asked to take care of their vehicle. As owners of their bodies, human beings take their health for granted. Self-negligence (the sin of indulgence) will be addressed by doctors. If anything, anticipation-informed medical care (the long view) is primarily in the hands of each individual. A proactive healthcare perspective implies not only a modicum of hygiene, but also self-control (in all aspects of life, from diet, sexual activity, physical condition, psychological, etc.). It turns out that what makes sense in extending the life of the car’s engine, or of the car in general, is at least debatable when it comes to the human being. Modern car maintenance facilities are equipped with automatic diagnostic devices. The “Precision Medicine Initiative, (2015)” emulates the control mechanism model of engines endowed with sensors. Research into how and why individuals under permanent monitoring actually give up their responsibility for maintaining a healthy lifestyle is under way. Precision medicine and the demagoguery of individualized medicine (more a slogan than a reality) through permanent monitoring, takes the path of crowd decisions in matters of extreme privacy (Fig. 4). Just to conclude this discussion: Arguing in favor of descriptions appropriate to the functional behavior of biological systems, Rosen (1972b)-focused on defining what life isdstated that such descriptions “bear no simple relation to the structural observables which our physical technique can measure.” Still, conditioned by a culture seeking profitable problems, individuals in the consumer society end up being a nail in search of a hammering physician. The highly rewarded aesthetic surgery, in line with the obsession of “improving” anythingdas long as it requires no effort on the client’s partdas well as the constantly growing catalog of elective procedures (often unnecessary), documents a medicine run amok for the sake of profit. Only the variety of dubious supplements that fill the cabinets of the gullible layperson, competing with the “lofat” this and the “hi-protein” that adds up to more than 35 billion dollars spent without good reason (and not rarely detrimental). One example from among quite a few: Metabolic repair and optimization is the promised outcome of Elysium Health (a start-up company taking advantage of academic research of the m TORregulating enzymes call sirtuins). If nothing else, the credibility of MIT is at stake when the researcher (a faculty member of a leading university) taking the Basis pill reports as an outcome, “My fingernails grow faster” (Friend, 2017, 65). This (punch)line, shared by the scientist with the media was not intended as a joke. It is not only the physician trained to be the mechanic of human health, but the individual seeking deterministic answers to complex problems who determines the condition of medicine today, only to complain about it (Null et al., 2004, 2010). Fig. 4. The illusion that measuring everything helps maintain health is the consequence of a mechanistic view of medicine. The annual check-up returns very little value for both physician and patient. In the absence of a meaningful understanding of change, as it pertains to health, this kind of medicine has a very low predictive performance. Therefore, it is quite surprising that no one seems to notice that while the prediction of physical phenomena-how my car will perform-is rather successful (and getting better), once the same view is applied to the living, the performance is low-not far from the threshold of sheer guessing (Ioanni-is, 2005, 2016). For example, tumor-patient-drug interaction remains quite ill defined. Consequently, treatment success in oncology is still low, despite the enormous effort (not to mention cost) of all involved. Studies published in cancer journals are often retracted10. While cancer settled in as the main challenge to medicine, only rarely are alternative treatment methods considered. Heart disease belongs to the same area of reductionist-deterministic medicine marred by failure, despite the awareness of its terrible consequences. The internist takes note of higher blood pressure, the cardiologist prescribes pills (all with side effects, some dangerous), a psychiatrist addresses a stress situation-each one looking around their own lamppost, although the “key” they “lost”-the historic view-is evident to all. Then comes everyone’s favorite: what we eat (diet). The most recent recommendations pertaining to the role of fats in a healthy diet (Hyman, 2016) is relevant only because it is recent, but not in its broader predicament. In view of the record of this type of medicine, it can without reservation be stated that for emergency interventions (fractures, heart arrest, stabbings, shootings, etc. ), it explains its high cost, but not necessarily the public’s trust. However, medicine defined itself over time not only in reaction to breakdownsdhealing the sick, as defined in the Hippocratic Oathdbut also as a practice of maintaining health. Swearing by Apollo the Healer, by Asclepius, by Hygieia, by Panacea, and by all the gods and goddesses not to harm anyone is quite different from understanding the condition of medicine under circumstances of legal scrutiny (sometimes extending to the absurd). Still, lawsuits or not, poison is prescribed. What is FDA approved might kill youdas many drugs still dodbut as long as it gives the patient some relief, it bears the stamp of approval as large as the criminal ignorance upon which it is based. Reactive medicine, by its nature reductionist, is extremely successful. Nevertheless, it defies the Hippocratic Oath (in its original, naïve formulation, or in its more modern language). Good and harm are difficult to distinguish when a drug or surgery remedies some symptoms but aggravates the patient’s condition. The long view is sacrificed for expediency. In addition to being a major factor of death, medicine also generates a large number of patients for lifedin wheelchairs, hooked up to various dispensers and machines, in need of assistance 24 h a day, seven days a week, taking pills forever. interieur, which describes the organism’s relative autonomy (1995) It is quite interesting to notice that the theory of brain death (the basis of the President’s Commission Report11 that serves as guidance to physicians) acknowledges “the integrated whole.” For those alive, holism is usually left aside; at death, it is acknowledged as what is lost. If the conclusion that specialized medicine is a Pyrrhic victory sounds too drastic, let us balance it with the realization that abandoning the holistic understanding can lead to loss of life: The surgery was successful, the patient died. Every year, the medical community celebrates its ten (or fifteen, or however many) greatest accomplishments. There is no way to avoid the feeling of awe. Many human lives have been saved under extreme conditions. Amazing interventions of all kind, some involving new drugs, genetic medicine, prostheses, implants, and highly complicated procedures have been performed. The word “miracle” is the first to come to mind. But there is also the dark side, where numbers of a different kind-such as incorrect diagnoses, botched surgeries, and questionable medications (to name a few)- add up. “Death by Medicine” (Null et al., 2004)-the conclusion of a review of evidence associated with erroneous (if not incompetent) decisions-is one source of information (among others). Adverse reactions to prescribed drugs (in the millions); needless procedures (close to ten million a year), unnecessary hospitalization (over 12 million and growing) are documented with the aim of establishing some quality control criteria. Of extreme relevance is the overprescription of antibiotics. What once was the miracle treatment for infectious disease is rapidly becoming a curse, affecting the genetic profile of the entire population. In order to address bacterial resistance to antibiotics, in some cases two different types are prescribed: one to cure infection produced by H. pylori bacteria, for example, and a second to address the bacteria’s acquired resistance to the first. By the way: worldwide rates of resistance to antibiotics such as clarithromycin and metronidazole have doubled. To predict the long-term consequences of the use of antibiotics, used almost like aspirin once was-is close to impossible. Dedicating themselves to serving life, not undermining its long-term viability, doctors cannot ignore such consequences. The survival of the species is more and more questionable, not the least because of the medical care practiced. In our days one can read, in the vein of the report mentioned above, an assessment as devastating as, “… the American medical system is itself the leading cause of death and injury in the USA.” (Null et al., 2004, 2010). The British Journal of Medicine now rates it as the third leading cause (Makary and Daniel, 2016). Regardless, around the world, mortality rates associated with medical treatment are indicative of concerns that society cannot simply brush aside. 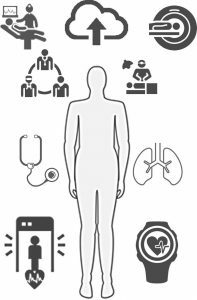 There are many factors to be considered: competence, interaction between physicians and patients (in particular, effective communication), the limits of medical knowledge, resource availability, and many more. It might also be that reactive-deterministic medicine at its best has reached its limitsda conclusion that has to come about from the medical community more than from its critics (and detractors). Of particular concern is the role that medication plays, its immediate and long-lasting consequences. In the public’s opinion, the pharmaceutical industry (let’s recall only Thalidomide, Vioxx, Hydrocodone, Oxycodone) seems driven more by the profit motive than sound medical practice. The chance is high that a patient complaining about some minor pain will be advised to “take ibuprofen” (or similar). A patient level metaanalysis drawing on a large population (almost half a million individuals) made it quite clear that the advicedwhen in pain, take a pill (i.e., reactive medical care)dmight have to be reconsidered. Depending on dosage and duration, oral non-steroidal anti-inflammatory drugs (NSAIDs such as naproxen, celecoxib, ibuprofen, diclofenac, rofecoxib) “can increase the risk of acute myocardial infarction” (Bally et al., 2017). It is cause for alarm that such widely recommended, apparently innocuous, drugs pose such risk. Such examples evince the resistance to understanding healing within an anticipatory perspective. To maintain an individual’s viability in the context of change (e.g., aging, styles of life and work) is quite different from repairing abused bodies within the framework of a mechanic’s shop, doubled by an alchemist’s chest box. The apothecary of the past was pretty rudimentary. “State-of-the-art” in pharmaceuticals today means not only modern chemistry, but also sophisticated genetics, nanotechnology, and computer modeling and simulation. New materials are invented, new medication procedures are testeddsometimes with spectacular success validated in painstaking detail within the approval for relevance procedure. Driven by the overarching philosophy of deterministic treatment, physicians and the pharmaceutical industry still seek the miracle “one-make-fits-all” drug. The living is limitlessly diverse and in never-ending change. Statistical distributions-such as those involved in drug approval-are valid in the physical but not in the domain of life. The fact that the same drug can save one person, and kill (or at least aggravate a condition) another, has not yet been properly understood, no matter how often doctors make this elementary observation. Together, the mechanics of body repair-always painful-and the chemists of the suspension of suffering created the means for making barbaric surgery (laser-guided, like the weaponry of our days) palatable. Patients exaggerate pain so they can get pain killers, in particular the powerful opioids, without which postsurgery is difficult to go through. This has resulted in an epidemic of drug abuse, to the extent that state governments in the USA are creating special programs to combat this addiction.12 In 2014 alone, almost 50,000 deaths due to drug overdose were recorded (Rudd et al., 2016). But if one hoped that these alarming numbers would trigger some anticipation-based concrete measures-at least in terms of a specific educational effort-that hope would be misplaced. Instead, the pharmaceutical industry develops other drugs, such as naloxone, as an antidote. Behavioral therapies-an anticipation-based alternative-have a lower profit return. That the means for pain suspension are addictive, because they are based on the effects of opiates, is a surprise only for those who want to be surprised. That treatment of opioid addiction involves more opioid exposure means only a life-long dependency, not a cure.13 We shall return to this when discussing the idea that in the living, by excellence the domain of ambiguity, the same cause might trigger a variety of outcomes. From the “Confessions of an English Opium Eater” (Thomas deQuincey, 1824) to our days of incessant pressure to legalize drugs (marijuana, in particular), little has changed in terms of professional responsibility. A report (Wilson, 2016) describes the England of deQuincey’s time as “marinated in opium, which was taken for everything from upset stomachs to sore heads.” Everyone wanted, and still wants, to get high. Physicians prescribed opium for menstrual discomfort or to children for hiccups, along with pills, tinctures, you name it. Today doctors prescribe opioids (under various names), amphetamines, or, where marijuana has been legalized, CBD (cannabidiol)dwith no consideration for the long-term consequences. Addiction is not a new phenomenon; neither is the tacit complicity of doctors and nurses, themselves often burned out by the cruel incidents they face in their profession. This is yet another aspect of anticipation ignored: exposure to pain and misery takes its toll. Are doctors appropriately prepared for the experience? Anticipation awareness will not make the problem vanish, but it will help physicians to understand its nature. Medicine changed as it adopted the industrial model, and decided to keep up with it. The patient changed as well. Following the physics-driven understanding of the living, medicine specialized to the extent that the whole called the human beingdbody, emotions, sensitivities, etc.dceased to exist. The fact that eyes and teeth are treated, even in terms of medical insurance, as independent of the rest of the human being is only illustrative of the idea we discuss in reference to “hardware.” Of course, it would be very difficult, if at all possible, to have a general practitioner as well informed about every part of the human being as those who specialize in parts. Some dentists do only implants or cosmetic dentistry; some ophthalmologists only perform laser surgery that will eliminate the need for contact lenses; others are cataract surgeons, placing lenses in the retina. Some orthopedists do knee replacements, others only hips or shoulders. Then there are specialists in the heart and the kidneys. And then there are the bariatric surgery “staplers” focused on interventions (gastric banding surgery) associated with obesity. It all became a specialized technology in defiance of the fact that there is no effective procedure for disentangling the whole. Obesity, for which diet and exercise, or some better-informed hormonal treatment, would be more indicated, becomes a doctor’s problem when in reality it is one life choice among others (except for morbid cases and certain genetic imbalances). The holistic nature of anticipation is almost never a consideration. Macular degeneration reflects processes in the entire body; tooth decay is telling of nutrition and oral hygiene, but it can also lead to developing heart disease. Knees and hips suffer not only due to physical abuse, but also because of malnutrition, bad posture, exposure to risk, and, of course, genetic predisposition. The mind and soul of patients were brushed aside. Patients accepted to be treated like a machine, and their body parts (eyes, ears, lung, heart, etc.) like components of machines. Those in need (or convinced by their doctors that there is no fast alternative) demand the most convenient remedyda pill, a short surgical procedure, a short rehabilitation cycledas quickly as possible. Therefore, an entire technology and appropriate treatment protocols have been developed to make the process more efficient. There are many factors at play when someone is faced with the (very profitable) surgery option. Some patients cannot afford to take off from work. The majority doesn’t understand their condition, not only because their own physicians don’t, but also because medicine fails to provide clear answers to their questions. Plus, science broadcasts the miracles of modern medicine, but never its failures. “Publication bias” means that negative research results that do not uphold an accepted hypothesis are difficult to publish, if they are published at all, while reports that uphold favored theories or practices (such as the virtues of marijuana) are more frequently published, and thus accepted into scientific “canon” (Nissen 2016). Such “canonization” leads to measures guided by what has become known as “the publication of false facts.” There is no day without yet another breakthrough mechanism almost never followed by an effective procedure. At the same time, those taking advantage of public ignorance continue to peddle “snake oil.” In the USA alone, commerce in pseudo-healing flourishes, not least because at times there is no way to distinguish between legitimate and illegitimate medicine. A suggestive explanation: during a person’s lifetime, arms and legs, feet and hands, neck and spine are subject to ever greater forces applied to them. It is a process with many dimensions: motoric expression is at the same time “sculpting” the body, contributing to its viability under extreme conditions. Running is stressful, especially when the act is not properly performed, but it is also vital in preserving the integrity of all that participates in the process. The energy budget of human motion is such that few, if any, physical entities (read: materials) would do as well as our muscles, tendons, cartilage, bones. If, however, something goes wrong-for whatever reason (wear and tear, an accident)-the process of substitution will entail an expense of energy probably on the order of magnitude as that involved in the breakdown. Knee replacement surgery (and the associated rehabilitation therapy) for instance, has a huge energy budget. It is of the same order of magnitude as that of the “making” (over time) of the knee, as well as of its deterioration. All this might explain why the salamander regenerome continues to fascinate researchers (for regenerative medicine, see Brody, 2016, Willyard, 2016.) Wouldn’t it be wonderful to learn from the regenerome how to engage molecular processes in healing? Only to suggest what kind of anticipatory processes are studied, let us recall that at-wound fibroblast cells are known to multiply and produce proteins that help in self-repair. Platelets release a stream of protein messengers (growth factors) to stimulate cell growth and tissue healing. Of course, such processes entail the long view, i.e., a duration not comparable to that of intense surgery with its very high expense of energy. Self-repair is driven by internal resources. (Remember: organisms are closed to efficient cause, cf. Rosen, 1991, p. 244). Anticipatory-based medicine will not fix in a moment (or in a 2-to-3-hour operation) what has been deteriorating over a long time or was damaged after a serious accident. For anticipatory informed medicine to succeed, it will have to engage the totality of the being, physical and spiritual, and unfold within the timescale of life, not of physical phenomena. Obviously, in a society conditioned to seek the fastest and shortest path, i.e., impatient in everything, this is not going to be the first choice. As a consequence of adopting the deterministic-reductionist paradigm, humankind seeks immediate relief, with little or no consideration of the long-term consequences. This attitude has led to a culture of throwaway, not to one of the long view of anticipatory action. Fully conditioned in the Cartesian perspective of the world, Western civilization lost sight of the price paid for the convenience of easy answers to questions that are deeper than assumed. If anticipation, as the complementary view of nature, is to succeed, it will be only on account of acknowledging that human survival is not a matter of physical law alone and of high-efficiency machines that might fix a broken leg or torn cartilage, but not restore health. Therefore, it is not excluded that those closest to the dynamics of human lifedmedical practitionersdwill lead in discovering the various aspects of what it means that anticipation is definitory of life. Doctors themselves will have to draw the conclusion that reaction-based medicine (often unavoidable) is not sustainable. It only augments the consequences of a lifestyle driven by the expectation of here-and-now, to the detriment of understanding consequences. In prosperity-obsessed cultures, the waistline grew regardless of how much more people exercise or how many more pills they swallow. It was the refrigerator that did it (as we know, in retrospect), in combination with medical establishment’s abandoning its function of prevention in favor of satisfying its patients, now turned into clients. Physicians know that people consume medical care, as they consume all the gadgets of the age of high technology. Medicine, captive to the same indulgence, gave up its human dimension-the artistry of the profession-in favor of more technology, limiting more and more human interaction with the patient: the 7-min examination, almost like the assembly line that Charlie Chaplin so expressively filmed in Modern Times. This is not a call to an idealized past of great physicians who, if they existed in this condition, were more a luxury (for those who could afford them) than the rule. It is, however, a clear statement in favor of a fundamental realization: machines can easily be maintained by machines. The state of the livingdhealth or illnessdis expressed not only in changed physical parameters (fever, heartbeat, blood pressure, etc. ), but also in interaction. The doctorpatient interaction is not an option, but a necessary condition for any medical endeavor, in particular for preventive medicine. Anticipation-based medicine implies a number of possibilities. As opposed to reaction, which is usually swift and short, involving high-energy transfer (cf. Newton’s third law), anticipation unfolds within the timescale of the process involved. The immune system is anticipatory. Its components (antibodies, white blood cells, lymph nodes, T-cells, bone marrow, spleen) evolve according to the specific dynamics of the bacterial and viral expression they address. Nothing is immediate. The possible infection-a future state that the organism would rather avoid-is identified before onset. A knee replacement-of course, sometimes necessary within medicine’s emergency model-takes less time than what genetic healing-still more a promise than reality-might one day take. Mechanical interventions introduce the clock of physics where, in the reality of the organism, many time-scales, some variable, have been empirically identified. The brutality of the “target and kill” and the “spare parts” understanding of medicine is not only limited to the procedure and the rehabilitation (under heavy use of painkillers that affect overall health), but also to the undermining of whatever health the patient still had before the intervention became necessary. Medicine, its pharmaceutical and industrial procedures, “heals” today-everyone wants immediate relief-and produces invalidity of deeper levels tomorrow. Avoiding such long-term consequences is yet another reason why the anticipatory view could end up not only changing the practice of medicine, but also extending to society. Is there one identifiable overarching reason for the reductionist deterministic path taken by medicine? Someone dedicated to understanding anticipatory processes will not be among those searching for the “one” reason, where evidently many factors are involved. Be this as it may, complexity is difficult to deal with. On the assumption that anticipation is couched in complexity (Rosen, 1991), one consequence cannot be avoided: medicine’s surrender to a mechanistic reactive practice is the consequence of considering the condition of its subject from a convenient practical perspective, not from one that corresponds to its actual dynamics. Life is the expression of an open-ended system of interactions that make possible the continuous remaking of its physico-chemical substratum. In this sense, what makes life possible is the transcendence from the level of a combination of elements (the constitutive atoms) into the making of cells and organisms with their own specific functions. In other words, from the simple and the complicated to complexity, there is a threshold. A concrete example will help in understanding the difference between non-living matter and life dynamics. Science made possible the engineering of tissues and even organs. Horst et al. (2013), Ren et al. (2015), Kang et al. (2016), among others, have reported in the making of ears, blood vessels, bladders, and other body components. 3D cell printing is visually convincing, but the culture of cells on a dependable scaffold (with the shape of the body part to be replaced) remains non-functional. Missing is the openended space of interactions carried out by the vascular, lymphatic, innervation, and other systems. There are no embedded live signaling molecules. Instead of integrating in the whole of metabolic processes (through which growth results), the implant dies, even if it is made of live cells. The anticipatory path does not reject the possibility of such replacements, but proceeds by enabling the bodydwhich some call the ultimate bioreactordto do it, pretty much like the continuous remaking of its cells. This is but another aspect of what distinguishes a system that can be described through a given phase space (the engineering approach) from one whose phase space changes according to a dynamic of renewal. The history of science, of medicine in particular, ascertains a viewpoint that does not negate complexitydwithout actually having defined itdbut argues for the need to reduce it. Claude Bernard (1813e1879), iconic figure of modern medicine, echoed Descartes when he wrote, “When faced by complex questions, physiologists and physicians … should divide the total problem into simpler and more and more clearly defined partial problems” (Bernard, 1957, p. 72). In the same spirit, Francis Crick (1966) postulated, without any proof, that “The ultimate aim of the modern measurement in biology is to explain all biology in terms of physics and chemistry.” This thought goes even further: Consciousness and mental states can be reduced to chemical reactions that occur in the brain (Bickle, 2003, Regelmorter, 2004). The fact that none of these ascertainments is falsifiable (in Popper’s sense) did not bother their originators and those who took them over. Arguing on account of examples-how often do physicians err in reducing a problem to a smaller one, or how many times the physics and chemistry were right, but the patient dieddis at best spurious. We have already pointed out that the identical physicochemical substrate translates into a variety of living expressions. The broad image of medicine in these days of spectacular scientific and technological creativity is such that even those inclined to defend its record are not necessarily free of doubt concerning its progress. The human being landed on the moon, an accomplishment based on physics and chemistry (of course, made possible by the anticipatory goals and values transcending the design of rockets and control mechanisms). Still, experts really don’t know how to prevent the flu and other epidemics (especially the new ones). As Esvelt put it, “When nature does something that hurts us, we respond with chemistry and physics” (Lyme Disease Symposium, Boston, 2017). Medical offices are stuffed with expensive technology and have access to data acquisition and processing capabilities of unprecedented precision. But physicians still don’t know why some patients in a coma might be brought back to consciousness with Zolpiden (a sleep-inducing drug), and others not. Humans are aware of some of their feelings; their thoughts build up consciousness. The physico-chemical correlates of consciousness (in it variety of expressions) are part of it in a manner different from that of the components of bricks, cars, or computers. In fact, the living changes itselfda statement worth repeating. Awareness of physical law (such as gravity) and anticipatory expression (falling the “right way” to avoid hurt) are not correlated. Not knowing the laws of physics and chemistry does not prevent the mountain goat from successfully negotiating the most challenging mountainous landscape one can imagine (Fig. 5). As a matter of fact, there are no numbers or knowledge of physics and chemistry involved in the living. Numbers and theories describe successful or failed actions after the fact. Albeit, arguing from examples does not lead to knowledge, rather to questions. These are the outcome of the daily activity of each physician. Very few cases are as clear-cut as the patient, the insurance, the doctor, and society would like them to be. It takes dedication (and money) to become a physician. This is about lifedsuch as in assisting a woman in giving birthdbut also about what happens when life is subject to change (beneficial or detrimental), when life comes to an end. Physicians cannot avoid seeing themselves in each and every patient. There is no tragedy in the breakdown of a machinedcar, computer, whatever. Mechanics don’t lose sleep over them. There is tragedy in loss of life. To apologize for bringing up in a scientific text many aspects, not least emotional, of practicing medicine would be meaningless, since it is in the nature of the activity to fail, even when best praxis is applied, or most recent science is deployed (for a personal testimony on the matter, see Schattner, 2017). Same treatment (for the same condition) with opposite outcomes translates as non-determinism. Medical personnel have experienced his, but without ever fully understanding why. Neither physicians nor the growing number of researchers in medicine, and even less the patients are interested in the philosophical aspects of the nature of the living. Physics or chemistry, or both, machine or not, what counts is the outcome: maintaining health or, when it fails, promoting means and methods for regaining it, or at least some of it. Knowledge accumulated over time made possible spectacular progress in understanding the nonliving part of reality. That this knowledge is only partially relevant to the living is convincingly illustrated by the theory and practice of medicine. Therefore, doubts whether the knowledge of physical and chemical phenomena is appropriate for understanding the living were also expressed, maybe not in the loud triumphal assertions mentioned at the beginning of this section. Moreover, conflict among those not given to the idea that the human is a machine, or only yet another instantiation of the laws of physics, separated the proponents of each of those positions. The dialog between the “mechanics” of human health and those trying to perceive it from a different perspective ceased. Captive to dogma, science becomes autistic. Economic considerations have led to a competitive effort in which denying each other is rather the norm: The next grant is at stake! Of course, competence level is important; so are the means used for diagnosis. Still, even assuming some common denominatordwell-trained physicians, up-to-date technology, qualified assistants, relatively stable societal background-the diagnostic varies from doctor to doctor (some are more artful and competent than others), and treatment depends on many factors unrelated to the actual condition addressed. Depending upon the condition examineddfrom flu symptoms to a variety of inflammatory conditions, from diabetes or asthma to all kinds of insufficiencies, addiction, degenerative conditions, and up to heart disease and cancerdthe variability of evaluations is as much a map of a territory changed by an earthquake as it is the seismogram of the event. It speaks in favor of the profession that patients are (sometimes!) advised to seek a second opinion; that more and more doctors interact, consult with each other, and exchange data. Auto mechanics (convinced that they do what a medic does, but for less money) get the diagnosis right because the knowledge domain is rather limited (and there is no room for ambiguity). Physicians often rather guess (or speculate) than get the right answer. They themselves are changing as they examine their patients. Their subject does not stay still (not even in a state of coma), as opposed to the relative stability of the states of a physical system (automobile, computer, or rocket). The patient, part of a larger entity (family, community, society) is an open system, of a dynamic no physical entity comes even close to mimicking. This situation ultimately translates into a question that doctors continuously face: Is medical care possible? In recent times, with the advent of the internet, their patients started knowing more about their own condition than those they pay to address it. Fig. 5. A mountain goat negotiates a challenging landscape. 14. Is medical care possible? Health (or lack thereof) is an expression of the complexity that defines the living. The meaning of the word complexity (its semantics) is as well or ill-defined as that of health. Revisiting dictionaries, old or new, or the etymology, does not afford more clarity. Leibniz seems among the first to examine science from a complexity perspective (Calude, 2007, Chaitin, 1970). In his view, laws should not be arbitrarily complex. If they are, the concept of the law becomes inoperative. Henri Poincare, (1905) and, closer to our time, Ilya Prigogine (1997) expressed interest in prediction (relation to future) as it is related to complexity (they are mentioned in connection to “chaos” theory, i.e., dynamical systems theory). Of course, medicine seeks simple definitions for medical conditions, so that doctors can use them without difficulty. From the perspective under examination here, Rosen (1978) remains the closest reference to the complexity intrinsic in living phenomena. In his view, there is no largest model for complexity; a complex entity is not fractionatable. On the pragmatic level, where medicine is anchored, complexity stands in the way of efficiency, in particular, efficient treatment-regardless in which form. In facing the complexity of the living, doctors are asked to simplify. Their patients are not known for patience (no pun intended), even if simplification results in treatments that lead to life-long dependence. The reductionist-deterministic model, useful in conceiving chemical means (i.e., drugs) of extreme efficacy (a subject discussed in the previous section) is an expression of the attempt to understand which representations of a disease, that is, which symptoms, are easily addressable. The goal of explanationsdlet’s say, how aspirin works, what are the consequences of taking ibuprophendis to guide the medical care decision-making process: what the patient should do, what the physician should do. For this purpose, measurements are performed to find out which processes are triggered by some medications. The goal is to gain access to knowledge about phenomena otherwise difficult (if not impossible) to explain. “What is a headache?” refers to a phenomenon as common as it is different in its variety: throbbing, sharp, back of the head, at the temples, at the forehead, in reaction to a stimulant, chronic, etc. There are no two identical headaches. In each examined case, the medical practitioner seeks to simplify, reduce the problem, find a common denominator. For each situation, the search for a cause (apparent or not), i.e., what determines the problem, guides the successive steps. Implicit in the effort is the acceptance of a principle working well in respect to physical phenomena: same cause, same effect. Reductionism and determinism made possible the universe of medical technology, the pharmaceutical industry, the surgery technology, measuring technology, and a large testimony of practical experience. The need to recover what physicians leave out in their assessment, what they discard or simplify, originates from the understanding of life as the unity of what makes up the organism and the particular dynamics of the living. To define complexity is actually the equivalent of walking back from the simplifying diagnostic to the condition(s) that prompted it, i.e., to all those connections discarded because they seemed farfetched, or because doctors simply don’t understand them. This is, in simple terms, the realm of complexitydsometimes (mis)understood as the open realm of guessing. A clear criterion (or criteria) for identifying it is more urgent than ever before if we want medicine to overcome the limitations inherent in its reductionistmechanistic practice. So far, the focus has remained on scale, i.e., on quantity-the false assumption that complexity is a qualifier, a label for a large number of variables. Actually, complexity defines quality, more precisely, the richness of interactions made possible. The unicell is complex; the computer is complicated. However, complexity, as consubstantial with the living, is of high-order consequence for medicine. If the living, in particular the human being, is complex, knowing the medical subject in its complexity is of practical importance, not a matter of labeling it. In a different context, I introduced a more general understanding of complexity as it relates to the human being-and implicitly to veterinary medicine (Nadin, 2014, 2017a, 2017b). I will summarily define the concepts and try to relate them to medicine. The reason is simple: to make available an understanding of the nature of what medicine actually deals with. Gödel presented proof that a theory capable of describing elementary arithmetic cannot be both consistent and complete, i.e., it is not decidable. Undecidability is the qualifier applied to a formal system -that of arithmetic-deployed in our attempts to describe reality. To generalize from characteristics of a formal system to reality is epistemologically not unproblematic. On the one hand, we have the constructs-numbers (standing for measured quantities) and operations among them-that we use to describe some aspects of reality. On the other hand, reality itself is not reducible to only quantitative representations. What justifies the generalization of the qualifier decidable (and its pendant, undecidable) is the rational premise: If in describing something-an aspect of reality per se or representations of such an aspect-the purpose is to come to an effective way for handling the reality or the theory about it, decidability becomes a threshold value for a precise expression of complexity. We can fully describe any human-produced artifact, and we can set consistency as a goal: we know what a brick is made of and which properties of this human-made artifact can be expected. The living, which continuously creates itself, is undecidable. The threshold between the decidable (non-living) and nondecidable actually defines G-complexity. As a consequence, decidability cannot be left out of considerations of an activity (such as the practice of medicine) that has to account for the whole (holistic aspect), but at the same time is faced with the implicit inconsistency of change in the living. In addressing the question of what distinguishes the living from the non-living, I extrapolated undecidability from a particular formal system (that of numbers) to the reality described using such a system exactly because of the practical consequences of G-complexity. Those inanimate parts of the reality that make up the physics or chemistry domain evince a dynamic that can be described completely and consistently; that is, a full description that is at the same time consistent is possible (although rarely pursued). We build homes, materials, cars, airplanes, all kinds of objects, computers and a variety of soft products (i.e., software performing a desired functions), all of which we can measure in detail and use the data to fully and consistently describe them. As a matter of fact, our plans for making them are decidable descriptions. Engineering does it; technology makes it possible. This is why we can fix them without having to face the multitude of problems that doctors have in trying to “fix” their patients. The dynamics of the inanimate is limited. The laws of physics are the expression of their decidability. The living, of unlimited dynamics, turns out to be undecidable. Empirical evidence made us aware of it. There can be no complete and consistent description because, as the living interacts with the world in which it unfolds, it changes, it continuously remakes itself. This explains why its phase space itself (of variables describing its processes) changes. The laws of physics apply, fully, to the matter in which life is embodied. Nevertheless, the laws of physics and/or of chemistry are only partially pertinent to change in the living. Gödel’s theorem is as far as one can imagine from the work of a physician or a surgeon. The consequences of applying decidability to defining the domain that physicians work in are evident in respect to the inescapable need for acknowledging the interdependence of what makes up an organism (Fig. 6). Fig. 6. Neither the whole body nor parts of it can be described fully. The physician acts on partial descriptions (such as those derived from new technologies, see Topol, 2012), on his or her own observations, measurements (usually discrete numbers representing blood pressure or temperature at some moment in time), or a record of the past (subjective or objective). The observations can be symptoms, some easily noticeable even upon superficial examination, others requiring elaborate evaluations, measurement included. In the last ten years only, the number and variety of measurements that progress in technology (variety and sensitivity of sensors, mobile tracking, datamining, etc.) has facilitated has grown exponentially. A high degree of sophistication was already reached in discriminating among many parameters, some interrelated (but of variable interconnectedness), others incidentally correlated. To assume that the practitioner, who examines thousands of patients, deals directly with the big data associated with all that can be measured is naïve (not to say impractical). Technology-facilitated data acquisition is way ahead of our full understanding of its meaning, even for experiment-based methods. Most of the time, experts do not know how-and even less why-their successful methods work (Esteva et al., 2017). To attempt to fully describe change in the living through data, in a manner parallel to that of describing the physical, is bound to fail exactly because the two processes are different. An open system-which the living is-cannot be fully characterized. Even if it could, that will not change the fact that full description and consistency are reciprocally exclusive. Phenomena of G-complexity-to which those associated with any organism, human being included-escape both reductionism and determinism as exclusive descriptions of their causality. Since there is no effective decomposition rule, medicine is open to all kinds of methods-from sheer fraud (Harris, 2017) to strict science-from among which some selection must ultimately be made. The consistency clause ascertains that inferences implicit in determinism (same cause / same effect, without any thought left for uncertainty and ambiguity) do not hold for the G-complex. Every medical practitioner has experienced this. Take as example only the screening for prostate cancer-the PSA (prostate specific antigen). Shifting recommendations arose as a result of noticing that the PSA was not significant in a large segment of the male population. Screenings rate declined by over 20 percent among men 50 years of age and older. But so did the incidence of cancer they are supposed to detect as early as possible: less screening/less incidence. The National Health Interview Survey (NHIS) released in 2015 suggests that a broader perspective leads to shared doctor-patient decision making and longer patient life expectancy. Nothing is cause-free. In the living causality is expressed in forms that no longer submit to the apparent time sequence characteristic of determinism. Capturing the dynamics of life’s physical substratum, determinism and causality, together with non-determinism and a-causality (i.e., within a condition of complementarity, as Niels Bohr defined it) afford a more adequate understanding of how life is expressed. This understanding should inform medical care, for instance, in distinguishing between health and illness, or in characterizing various deviations from averages that make little sense. Helicobacter pylori (H. pylori) infection, present in almost 60 percent of the world’s people, can cause peptic ulcers and thus increase the risk of duodenal and gastric ulcer (the second leading cause of cancer-related death). Barry J. Marshall, assisted by Robin Warren, experimented on himself in tracing gastric ulcer to H. pylori. The deserved Nobel Prize did not come with the clinical data according to which the same bacterium can prevent other forms of cancer (such as adenocarcinoma).15 This is only one from among many examples of G-complexity; that is, the undecidable expressed in “damned if you do, damned if you don’t” medical challenges. 1) The knowledge domain of medicine is the non-decidable. Above this well-defined threshold of complexity there are no degrees. If treated under the complexity threshold, the system is equivalent to any physical systemdand the criteria for maintenance correspond to this condition. There is no room for equivocation. If treated at the G-complexity level, healing and self-healing (which is anticipatory) imply processes characteristic of the living. 2) Decidability is the precise criterion for G-complexity. In some cases, and under current conditions of knowledge, medicine has to settle for the domain of the complicated (a heart transplant, a knee replacement), where reactive-mechanistic methods are necessary. But fundamentally, it has to seek ways to trigger natural processes, such as genetic-driven methods of repair and self-repair, or immunotherapy (these are only examples). The unity of the twodreaction and anticipationdis difficult to achieve, but it would ascertain an understanding of medicine that corresponds to the condition of life. 3) A G-complex system is characterized by the fact that its information level is always higher than the information received from the environment; that is, it generates information. Every patient becomes part of the interaction called treatment. In physics-based interventions, which have one answer (univocally defined), this co-participation is minimal. The ambiguity space of possible futures is where patient and physician actively search for plausible answers. Interaction between patient and physician (Gupta et al., 2017), and among physicians assigned to the same case (or to cases of some degree of similarity) is a prerequisite of individualized medicine. 5) G-complex systems are adaptive systems; physical systems are defined by sameness; that is, they are not affected by context. For medicine this means the understanding that disease itself is related to adaptivity. Moreover, the agents of illness (microbes, viruses, foodborn pathogens) are themselves adaptive. Medicine fails when it ignores the complexity of these concurrent processes. As already mentioned, antibiotics and the negative consequences of their deterministic use (e.g., take one antibiotic for targeting a bacterium, and a second for targeting the resistance of the first), opioids, as well as the MRSA crisis are co-authors of an irreversible process that undermines not only the human species, but life on Earth in general. Adaptivity, understood within anticipation-informed medicine, is a blessing. Mutations, if they result from a limiting deterministic course of action, are a curse. Solid proof that learned responses lead to genetic mutations (Robinson and Barron, 2017) suggests that microbes not only develop resistance to antibiotics, but also that using antibiotics affects the genetic make-up (not only of the immediate patient, but also of his/her environment). Along this line, it can be assumed that changes grounded in epigenetics triggered by some forms of medical care (e.g., prolonged use of drugs, early changes in physiology, motoric response through implants of all kind) progressively undermine the genetic integrity of the entire organism. Patients embody their history; the future, related to possible interactions (some beneficial, others detrimental) is continuously anticipated in a state of preparedness (for the next interaction). The preparedness of each one of us is a matter of record, not a dreamedup hypothesis. Aging, for instance, is the example of the organism’s preparing itself, at all levels of its functioning, for a new systemic condition. Take note that the function is entity specific (fEi). Let’s say a patient complains about back pain. One person’s back pain is always different from any other-no two back pains are the same. The simple equation says that the state of the patient experiencing pain depends upon some parameters-let’s say a certain movement triggers the paindand the interaction of the patient in the context. Interactions (IEi), part of the dynamics, are also specific. The fact that the function is entity specific excludes generalizations. Evidently, the specific dynamic of one identity actually differs in indeterminate ways from the dynamic of any other entity. The aggregate value is therefore meaningless. G-complex entities are closed to nomothetic16 descriptions. 8) G-complex systems are relational. Living entities are interrelated. Medical assessments that take relations into consideration have to acknowledge their variety. An easy illustration is the state of a pregnant woman and the “mirrored” state of her husband; so is the parent-child relation. The model of mirror neurons represents a good example of how relational aspects are expressed. The relational nature of the living translates into practical consideration in the process of medical assessment. It is never the case that a symptom can be examined independent of the relational space in which it manifests itself. Physicians actually report on such factors when they seek correlation: patient’s state, family relations, medical history of those constituting the patient’s milieu. 9) Within G-complex systems, self-evolving anticipatory processes are possible. For healthcare, the integrated anticipatory endowment should translate into awareness of the practical consideration informed by the patient’s and physician’s shared awareness of past, present, and possible future. Againdnot as an example, but illustrationdthe changed metabolism associated with aging suggests a different diet, but also an appropriate program for maintaining physical condition. The fact that “reactive” doctors, eager to “keep the machine going,” increasingly overwrite the self-evolving anticipatory process is probably more than a matter of medical ethics. Agedefined “infertility” has its own significance in the dynamics of the living (birth, reproduction, death). A woman’s giving birth at age 60 (and higherdthe competition is on!) might give her doctor reason to be proud of a performance that in the perspective of time will probably not make anyone happy. A G-complex system is an evolving record of entangled past states, current states, and possible future states. For the observer, such as the house physician, patients’ actions are the expression of successful or failed anticipations. Practitioners of medicine will benefit from understanding the non-deterministic nature of both health and disease. “I smoked and drank all my life and lived to be over 100,” expresses this anecdotally. Others pay dearly for being only subjected to second-hand smoke. Complicated systems are made of simple systems, or they can be reduced to a limited number of simple systems. A replacement knee or an artificial kidney corresponds to the decision of reducing the complexity of the integrated living entity to its material physical embodiment. Complicated systems are subject to observation and measurement. The surgeon inspecting the integrity of the implant performs an engineering task. To know such a complicated system is to capture its regularity, obvious or hidden. This regularity is eventually expressed in the laws predicting their behavior. The living (knee, hip, shoulder, kidney, heart, etc.) is for life; the replacement has a warranty, as does any other industrial product. Its life cycle depends on use, design, and quality of materials maintenance. The experimental method as a source of knowledge about the physicald“How do such devices perform?”dis based on the assumption that competing explanatory models (i.e., hypotheses) can be empirically tested. “What are the consequences for the rest of the body?” is a question that the experiment excludes because a holistic view is not a choice within a reductionist procedure. These considerations apply as well to the validation of chemical interventions (e.g., drugs, unguents, ointments, bodily fluid replacements). As he advanced a holistic perspective, Jan Smuts (1926) argued that, “we have to return to the fluidity and plasticity of nature” (p. 17). Moreover, “the surrounding sphere of meaning” (p. 18), the rich space of interpretations, is by no means less significant than that of the rigid physical and chemical constraints. contributions in the volume on Psychosomatic Medicine (edited by Thure Uexküll von, 1997), Eugen Baer’s Medical Semiotics (1988), as well as Biosemiotics in Medicine (edited by Farzad Goli, 2016). This is not the place to argue with one or another author. The intention is to draw attention to research that evinces aspects of meaning in the practice of healing. It is obvious that each time the meaning of certain medical interventions is either ignored or misunderstood, the quality of the medicine applied suffers. Inflammation associated with implants are not mechanical accidents, but the outcome of biological processesdsome reactive in nature, others related to anticipation expressiondstill not really well understood. “Breast implants linked to cancer” is not just a headline, but a document of reactive medicine, defying meaning, at its worst (Rettner, 2017). Experiments are always closed systems, within which variability (of parameters) can be quantitatively described. The dosage for a medicine is such a variable. But in realitydwhere industry produces standardized dosagesdapproximation, “fitting,” and customization are excluded. The fact that practitioners of medicine would prefer to have a higher degree of freedom in their prescriptions is not a secret. In the past of a rudimentary medicine, the doctor’s “secrets” extended to “proprietary formulae for ointments, herbal treatments, etc. Chinese medicine still pursues this practice in some cases. The clear-cut distinctions of physics and chemistry are counter-intuitive in the evaluation of medical conditions and remedies. This is why, when mainstream science rejected fuzzy set theory (Zadeh, 1965) as an expression of abandoning precision, medical practitioners, usually adverse to mathematics, embraced them (see Albin, 1982; Adlassnig, 1983; Sadegh-Zadeh, 2001). It is reasonable to rely on experiments for knowledge acquisition or confirmation when the dynamics examined and the experimental timeline are congruent. Since science by its nature is an interrogation, it is at least surprising that no one questions the validity of experiments for contingency. Even Aristotle (in De Interpretatione), whose logic still dominates the thinking of scientists seeking clearcut distinctions between what is true and what is false, questioned the validity of such distinctions in regard to future contingencies. Given the expectation of not doing harm to the human being, many experiments are performed on living substitutes (mice, rats, pigs, monkeys) or models (digital or otherwise). The former case is more realistic, although it implies an equivalent of a sort between the humandwho acquired self-awareness in the process of “creating” themselvesdand animalsdcomplex entities with a different degree of self-consciousness. it does not necessarily work in any other living being (not to say human beings), here are a few observations: The “synthetic” mice, made on spec (recently using CRISPR as a gene editing tool), are probably useful for learning about its own condition. However, if one is searching for a cure to Alzheimer’s in mice, the address is misleading. Empirical evidence shows that mice are not subject to Alzheimer’s or to other spectrum conditions. An engineered mousedi.e., subject to being transformed from a non-decidable to a partially decidable entitydforced to age (through the use of radiation) has few, if any, similarities to aging humans. Aging itself might be an evolutionary outcome, but it is not similar in flies, elephants, or orchids. Culture plays a very important role, as does society. While death is implicit in the dynamics of all the living, it is not the same death affecting a unicell or a very long-living turtle. Curing mice of anything is different from curing a person. The bottom-up/top-down dynamics is species specific. It works differently in lions, fish, trees, etc. There cannot be complete information about a G-complex system, i.e., about a living entity, since the information it takes in changes its state; moreover, it produces information as it evolves, as it ages. The living adapts to a variable world, and interacts with it. Life is interaction. Therefore, the experimental model pertinent to the domain of the decidable (we can fully describe, contradictionfree, the physics and chemistry underlying the existence of the living) is not applicable in the G-complexity domain. Once again, no two individuals (man/woman, young/old) are the same; no two medical conditions are identical, and sometimes not even close enough to justify using the same label. Given their evolutionary variation, surrogates (mice or whatever) are even more deeply different. These are very concrete aspects that should inform research and medical practice. Nobody wants to exclude examining the patient through the “eyeglasses” of physics or chemistry-“How does the machine work?-rather, to complement such an examination with data pertinent to the anticipatory characteristic of life. A very large number of medical experiments are carried out and presented as trustworthy validations of new knowledge. This feeds the illusion that reductionist-deterministic science generates significant knowledge through such experiments, and that this limited knowledge can be generalized. The “data-and-experiment cult,” together with publication bias, became more a component of the politics of science than an intrinsic part of gaining knowledge about the worlddabout the complexity of life, in particular. Even generalizations built upon statistical averages and probability distribution, or on sampling techniques, defy the nature of the entity subject to knowledge acquisition. A doctor will not better address a patient’s health condition based on averaging. The patient’s unique profile is the authentic source for describing his or her condition, and for assessing its dynamics. The living can be computationally simulated in a non-living substratum (everything ca be a medium of computation) only partially. The entire effort of embedding computation in artificial entities emulating aspects of the living (synthetic neurons, artificial muscles, synthetic DNA, synthetic cells, etc.) deserves respect for the gnoseological, scientific, or technological outcome. However, the outcomes of the computation on such substrata can only reflect the assumptions embedded in the emulated synthetic world. They confirm the physics of the living, not its specific condition. In order to escape the vicious cycle of mechanistic medicine, we definitely need a better understanding of how anticipation is expressed in all actions through which life takes place. It is amazing that medicine seeks answers mostly in physics, chemistry, computation and AI while the new sciences (of e.g., artificial DNA, simulated evolution) are determined to find in the living answers to the most fundamental questions they face. Let us end these considerations with one more observation: Physical and chemical processes have well-defined outcomes. Living processes have multiple outcomes, some antagonistic (Fig. 7). It has long been established that the same medication can be beneficial to some and (highly) detrimental to others: the “paradoxical effect” of medication. For example, benzodiazemine17 can trigger aggressiveness instead of acting as the tranquilizer it is meant to be. The resulting damage to the patient is the consequence of the prevalent practice of medicine-as-deterministic, that is, same cause (the drug prescribed), the same consequence. Fig. 7. Natural processes have multiple outcomes. Science based on deterministic assumption delivers predictions that, in the final analysis, validate them. Beyond determinism is the realm of a more comprehensive understanding of causality. It integrates the possible future. Creativity originates in this realm. Neither sexuality nor the affective and the emotional, nor awareness and consciousness can be explained in deterministic terms. As cultural artifacts, the states called illness, sickness, and even health are nothing but labels for specific instances of life dynamics. Therefore, medicine has to be conceived and practiced within a comprehensive understanding of what life is and what change means. Since anticipatory processes are definitory of life, to understand how and why they take place is to understand how medicine can change from “mechanistic” intervention to interactions with healing consequences. The living is its own efficient cause, and thus healing is the expression of its self-creative nature. Over the years, I consulted with many practicing physicians, to whom I wish to express gratitude for their patience with someone who quite often questioned the profession through which they make a living. This paper benefited from a rigorous peer review. It is a rather humbling experience when reviewers take time to formulate, over many pages, observations, suggestions, and objections. But it was also rewarding. Jamie Field provided assistance while trying to understand the subject. The research was supported by the antE, e Institute for Research in Anticipatory Systems (ATEC School of the University of Texas at Dallas). 1 National Academy of Medicine, https://nam.edu/initiatives/grand-challengehealthy-longevity/. The initiative was presented at the 2015 Annual Meeting of the NAM, https://nam.edu/event/nam-annual-meeting/. genome.” “Tell me where it hurts,” The New Yorker, January 23, 2017, 36e45. Pharmacy, show 1109, February 10, 2018. Quest to Live Forever,” The New Yorker, April 3, 2017, pp. 54e67. 6 World’s oldest known oxygen oasis discovered. Science Daily, January 18, 2018. 7 PSA stands for prostate-specific antigen, a protein produced by normal or malignant cells of the prostate gland. PSA is a number: nanograms of the protein per milliliter of blood (ng/mL). Simulacron-3, 1964. The hero, a cybernetics engineer, uncovers a corporate conspiracy in which real persons are replaced by “virtual” reproductions. 9 WHO Suicide data. Suicide occurs throughout the lifespan and is the second leading cause of death among 15e29 year olds globally. www.who.int/mental_ health/prevention/suicide/suicideprevent/en/. 10 A new record: Major publisher retracting more than 100 studies from cancer journal over fake peer reviews. See Retraction Watch, http://retractionwatch.com/ 2017/04/20/new-record-major-publisher-retracting-100-studies-cancer-journalfake-peer-reviews/. 11 Guidelines for the determination of death. Report of the medical consultants on the diagnosis of death to the President’s Commission for the Study of Ethical Problems in Medicine and Biomedical and Behavioral Research. JAMA, 1981 Nov 13; 246(19):2184-6. 12 The American Pain Foundation and its affiliated physicians and drug companies (the makers of Percocet, OxyContin, Duragesic, etc.) encouraged prescriptions for opioids (https://www.statnews.com/2016/06/27/opioid-addiction-orrin-hatch-ron-wyden/). feeding addiction while trying to alleviate a patient’s pain. Rainer Werner Fassbinder’s film Veronika Voss (1982) is a useful reminder for those commenting on the effects of addiction. 14 Google, processing data associated with search patterns, issues diagnostics and health predictions. The machine might soon claim a degree in medicine or the right to be recognized as a provider (assuming that the AMA, still controlling who can be a physician and how many society needs, will accept the claim). 15 Immune Cells May Induce Gastritis During H. Pylori Infection. Science Daily, May 27, 2008. https://www.sciencedaily.com/releases/2008/05/080523071035. htm. See also https://www.nobelprize.org/nobel_prizes/medicine/laureates/2005/ press.html. expressed in the practitioner’s activity. If only the effort of individualization were to be considered, this would already confirm the idea. 16 Of or relating to the study or discovery of general scientific laws. 17 British Medical Journal, 1:5952, February 1975. Adlassnig, K.P., 1983. A Computer-assisted Medical Diagnostic System Using Fuzzy Subsets. Doctoral dissertation. School of Computer Science, Technical University of Vienna. https://www.researchgate.net/publication/243777616_CADIAG-2_ Computer-assisted_medical_diagnosis_using_fuzzy_subsets. http://www. meduniwien.ac.at/kpa/. Albin, M.A., 1982. A fuzzy logical model of computer assisted medical diagnosis. Meth. Inf. Med. 19 (3), 141e148. Auletta, G., Ellis, G.F.R., Jaeger, L., 2008. Top-down causation by information control: from a philosophical problem to a scientific research programme. J. R. Soc. Interface 1119e1135. https://doi.org/10.1098/rsif.2008.0018, 6 October 2008. http://rsif.royalsocietypublishing.org/content/5/27/1159. Baer, E., 1988. Medical Semiotics. University Press of America, Lanham MD. Bally, M., et al., 2017. Risk of acute myocardial infarction with NSAIDs in real world use: bayesian meta-analysis of individual patient data. Br. Med. J. 357, 1909. https://doi.org/10.1136/bmj.j1909 (Published 09 May 2017). http://www.bmj.com/content/357/bmj.j1909. Bernard, C., 1957. An Introduction to the Study of Experimental Medicine. Dover Books on Biology, New York (Greene, H.C., trans.). Bernstein, N.A., 1936. ??w???????? ?a????? ? ?????????? ???w???? ?? ?/?aa?/Sovremennye Iskaniia V Fiziologii Nervnogo Protsessa. Gosudarstvennoe izdatel’stvo biologicheskoi i meditsinskoi literatury, Moscow/Leningrad. Bernstein, N.A., 1967. The Coordination and Regulation of Movement. Pergamon Press, Oxford. Bernstein, N.A., 2003. Sovremennye iskaniia v fiziologii nervnogo protsessa (Contemporary inquiries into the physiology in the nervous process). In: Feigenberg, J., Sirotkina, I. (Eds.). Smysl, Moscow. Bickle, J., 2003. Philosophy and Neuroscience: a Ruthlessly Reductive Account. Kluwer Academic, Dordrecht. Brentano, F., 1995. Psychology from an Empirical Standpoint (Rancurello, A.C., D.B. Terrell, L.L. McAlister, trans.). Routlege, London. Brody, H., 2016. Regenerative medicine. Nat. Outlook 540. https://doi.org/10.1038/ 540S49a. December 8, 2016. Calude, C.S., 2007. Randomness and Complexity: from Leibniz to Chaitin. World Scientific, Singapore. Canales, J., 2016. The Physicist and the Philosopher Einstein, Bergson, and the Debate that Changed Our Understanding of Time. Princeton University Press, Princeton. Chaitin, G., 1970. What is life? ACM SICACT News 4, 12e18 (January). Clarac, F., 2005. The history of reflexes. Part 1: from Descartes to Pavlov. IBRO Hist. Neurosci. http://ibro.info/wp-content/uploads/2012/12/The-History-of-Reflexes-Part-1.pdf. Crick, F.H.C., 1966. Of Molecules and Men. University of Washington Press, Seattle. Ehrenreich, B., Ehrenreich, J., 1971. The American Health Empire: Power, Profits, and Politics. Random House, New York. See also Medical-Industrial Complex. https://en.wikipedia.org/wiki/Medical%E2%80%93industrial_complex. (Accessed 16 May 2016). Esteva, A., et al., 2017. Dermatologist-level classification of skin cancer with deep neural networks. Nature (London) 542, 115e118. January 25. http://www.nature.com/nature/journal/v542/n7639/full/nature21056.html. Esvelt, K., 2014. Community-guided ecological immunization to prevent tick-borne disease. https://www.lymediseaseassociation.org/faculty-biographies/1527kevin-esvelt. Fodor, J., 1987. Psychosemantics. MIT Press, Cambridge MA. Friend, T., 2017. The God Pill. Silicon Valley’s quest for eternal life. New Yorker 54e67. April 3, 2017. Geddes, L., 2016. Human age limit claim sparks debate. Nat. News & Comment. October 5, 2016. http://www.nature.com/news/human-age-limit-claim-sparksdebate-1.20750. Goldstein, K., 1995. The Organism: a Holistic Approach to Biology Derived from Pathological Data in Man. Zone Books, New York. Goli, F. (Ed. ), 2016. Biosemiotic Medicine. Healing in the World of Meaning. Springer International, Cham CH. Grisham, S., 2017. Medscape physician compensation report 2017. April 5, 2017. http:// www.medscape.com/slideshow/compensation-2017-overview-6008547?src ppc_google_rsla_ref_kw_&gclid Cj0KEQjw9YTJBRD0vKClruOsuOwBEiQAGkQjP9 GoIfLAQpuCEAmVxrBrVgEijaLhwJRKZyVoZxUlWTQaAtWE8P8HAQ. Gupta, S., Saint, S., Detsky, A.S., 2017. Hiding in plain sight e resurrecting the power of inspecting the patient. JAMA Intern. Med. April 17, 2017 https://psnet.ahrq. gov/resources/resource/31058/hiding-in-plain-sight-resurrecting-the-powerof-inspecting-the-patient. Harris, R., 2017. Rigor Mortis: How Sloppy Science Creates Worthless Cures, Crushes Hope, and Wastes Billions. Basic Books, New York. Hoffmeyer, J., 1997. Signs of Meaning in the Universe (Advances in Semiotics).Haveland, B.J., Trans. Indiana University Press, Bloomington. Horst, M., et al., 2013. Engineering functional bladder tissues. J. Tissue Eng. Regen. Med. (July) 7, 515e522. https://doi.org/10.1002/term.547. Epub 2012 Mar 21. Hunziker, E.B., et al., 2015. An educational review of cartilage repair: precepts & practice–myths & misconceptions–progress & prospects. Osteoarthritis Cartilage. Mar 23 3, 334e350. https://doi.org/10.1016/j.joca.2014.12.011. Epub 2014Dec 19. https://www.ncbi.nlm.nih.gov/pubmed/25534362. Hyman, M., 2016. Eat Fat, Get Thin: Why the Fat We Eat Is the Key to Sustained Weight Loss and Vibrant Health. Little, Brown and Company, New York. Ioannidis, J.P.A., 2005. Why most published research findings are false. PLoS Med. Agent. http://journals.plos.org/plosmedicine/article?id 10.1371/journal.pmed.0020124. Ioannidis, J.P.A., 2016. Why most why most clinical research is not useful. http:// journals.plos.org/plosmedicine/article?id 10.1371/journal.pmed.1002049. Ito, J.P., 2015. Repetition without repetition: how Bernstein illumines motor skill in music. In: Nadin, M. (Ed. ), Anticipation: Learning from the Past. The Russian/ Soviet Contributions to the Science of Anticipation. Springer, Cham CH, pp. 257e268. Kang, H.-W., et al., 2016. A 3D bioprinting system to produce human-scale tissue constructs with structural integrity. Nat. Biotechnol. 34, 312e319. Louie, A.H., 2017. Mathematical foundations of anticipatory systems. In: Poli, R. (Ed. ), Handbook of Anticipation. Springer, Heidelberg/London, pp. 1e29. Makary, M.A., Daniel, M., 2016. Medical errordthe third leading cause of death inthe US. Br. J. Med. 353 (2139). http://www.bmj.com/content/353/bmj.i2139. Moseley, G.L., Nicholas, M.K., Hodges, P.W., 2004. Does anticipation of back pain predispose to back trouble? Brain 127, 2339e2347. October. https://www.ncbi.nlm.nih.gov/pubmed/15282214. Musienko, P.E., Gorskii, O.V., Kilimnik, V.A., Kozlovskaya, I.B., Courtine, G., Edgerton, V.R., Gerasimenko, YuP., 2015. Regulation of posture and locomotion in decerebrate and spinal animals. Neurosci. Behav. Physiol. 45 (2), 229e237. Nadin, M., 1991. Mind-Anticipation and Chaos. Belser Presse, Stuttgart/Zurich. Nadin, M., 1999. Anticipation: a spooky computation. In: Dubois, D. (Ed. ), CASYS, International Journal of Computing Anticipatory Systems, Partial Proceedings of CASYS 99, vol. 6. CHAOS, Liege, pp. 3e47. Nadin, M., 2006. Anticipatory Control System in Support of Independent Aging. Proposal Submitted to the National Science Foundation. IIS-Human Centered Computing, NSF, pp. 06e572. Nadin, M., 2014. G-complexity, quantum computation and anticipatory processes. Comput. Commun. Collab. 2 (1), 16e34. Nadin, M. (Ed. ), 2015a. Learning from the Past. Early Soviet/Russian Contributions to a Science of Anticipation. Cognitive Science Monographs, vol. 25. Springer, Cham, CH. Nadin, M., 2015b. Anticipation and computation. Is anticipatory computing possible?. In: Nadin, M. (Ed. ), Anticipation Across Disciplines. Cognitive Science Monographs, vol. 26. Springer, Cham, CH, pp. 163e257. Nadin, M., 2015c. Anticipation and creation. Lib. Math. 35 (1), 1e17. Nadin, M. (Ed. ), 2016. Anticipation Across Disciplines. Cognitive Science Monographs, vol. 29. Springer, Cham, CH. Nadin, M., 2017a. Reporting on anticipatory systems: a subject surviving opportunism and intolerance. Autobiographical retrospective in recognition of major contributions to the systems movement. Int. J. Gen. Syst. 46 (2), 93e122. June 23, 2017 (online). Nadin, M., 2017b. Rethinking the Experiment: necessary (R)evolution. AI Soc. https://doi.org/10.1007/s00146-017-0705-8. March 2017. See also Rethinking the Experiment. https://arxiv.org/abs/1612.02491. Nadin, M., 2011. Annotated Bibliography: Anticipation. Special issue of Int. J. Gen.
Syst. 39 (1), 34e133. Taylor and Blackwell, London. Newell, A., Simon, H.A., 1972. Human Problem Solving. Prentice Hall, Englewood Cliffs NJ. Nissen, S.B., 2016. Research: Publication Bias and the Canonization of False Facts. https://doi.org/10.7554/eLife.21451.001. https://elifesciences.org/content/5/ e21451. Noble, D., Jablonka, E., Joyner, M.M., Müller, G.B., Omholt, S.W., 2014. Evolution evolves: physiology returns to centre stage. J. Physiol. 592, 2237e2244. Noble, R., Noble, D., 2017. Was the watchmaker Blind? Or was she one-eyed? Biology(Basel) 6, 4. December. http://www.mdpi.com/2079-7737/6/4/47. Null, G., Dean, C., Feldman, M., Rasio, D., Smith, D., 2004. Death by medicine. Praktikos books, Mount jackson VA (The book was reissued in 2010 by Axios Press.). http://www.webdc.com/pdfs/deathbymedicine.pdf. (Accessed 22 March 2016). Ozner, M., 2010. The Great American Heart Hoax. Lifesaving Advice Your Doctors Should Tell You about Heart Disease Prevention (But Probably Never Will). BenBella Books, Dallas. See also. http://www.nytimes.com/2009/01/06/health/ 06brod.html?_r 2&scp 1&sq ozner&st cse. Papineau, D., 1987. Reality and Representation. Blackwell, Oxford. Pflüger, E., 1853. Die sensorischen Functionen des Rückenmarks der Wirbelthiere nebst einer neuen Lehre über die Leitungsgesetze des Reflexionen (Berlin) quoted in Landois and Stirling, neuen Lehre über die Leitungsgesetze des Reflexionen (Berlin), quoted in Landois and Stirling. In: A Texbook of Human Physiology, pp. 662e663. Picollo, S., 2013a. Embracing mechanical forces in cell biology. Differentiation 86 (3), 75e76 (October). Picollo, S., 2013b. Developmental biology: mechanics in the embryo. Nature 504 (7479), 223e225, 12 December. Poincaré,, H., 1905. Electricité,. Sur le dynamique de l’electron, June 5, 1905, 140 (1905), 1504e1508. Note de H. Poincaré, CR.T. Popper, K., 1972. Of Clouds and Clocks. An Approach to the Problem of Rationality and the Freedom of Man, Objective Knowledge: an Evolutionary Approach. Oxford University Press, Cambridge. Precision Medicine Initiative, 2015. Cohort Program. US Department of Health and Human Services, National Institutes of Health. https://www.nih.gov/precisionmedicine-initiative-cohort-program. (Accessed 16 March 2016). Prigogine, I., 1997. The End of Certainty. The Free Press, New York. Regelmorter, M.H van, 2004. Biological complexity emerges from the ashes of genetic reductionism. J. Mol. Recogn. 17 (3), 145e148. Ren, X., et al., 2015. Engineering pulmonary vasculature in decellularized rat and human lungs. Nat. Biotechnol. 33, 1097e1102. https://doi.org/10.1038/nbt.3354. Robinson, G.E., Barron, A.B., 2017. Epigenetics and the evolution of instincts. Science 356 (6333), 26e27. https://doi.org/10.1126/science.aam6142. April 7, 2017. Rettner, R., 2017. Breast implants linked to cancer: how does it happen? http:// www.livescience.com/58376-breast-implants-cancer.html. Rosen, R., 1972a. Some relational cell models: the metabolism-repair systems. In: Rosen, R. (Ed. ), Foundations of Mathematical Biology, vol. II.. Academic Press, New York. Rosen, R., 1972b. Some systems theoretical problems in biology. In: Laszlo, E. (Ed. ), The Relevance of General Systems Theory. George Braziller, New York. Rosen, R., 1974. Planning, management, policies and strategies: four fuzzy concepts. Int. J. Gen. Syst. 1, 245e252. Rosen, R., 1978. Fundamentals of Measurement and Representations of Natural Systems. North-Holland, New York. Rosen, R., 1991. Life Itself: a Comprehensive Inquiry into the Nature, Origin, and Fabrication of Life (Complexity in Ecological Systems). Columbia University Press, New York. Rosen, R., 1985. Anticipatory Systems: Philosophical, Mathematical and Methodological Foundations. (IFSR International Series on Systems Science & Engineering, Vol. 1), first ed. Pergamon Press, New York. Rudd, R.A., et al., 2016. Increases in Drug and Opioid Overdose Deaths d United States, 2000e2014, Morbidity and Mortality Weekly Report (MMWR). Centers For Disease Control And Prevention, Atlanta GA. January 1, 201 6, 64:50, 1378e1382. https://www.cdc.gov/mmwr/preview/mmwrhtml/mm6450a3. htm?s_cid mm6450a3_w. Sadegh-Zadeh, K., 2001. Fuzzy genomes. Artif. Intell. Med. 18, 1e28. Schattner, E., 2017. The personal toll of practicing medicine. Health Aff. 36 (2), 371e375. Searle, J., 1992. The Rediscovery of the Mind. MIT Press, Cambridge MA. Sidney, S., et al., 2016. Recent trends in cardiovascular mortality in the United States and public health goals. JAMA Cardiol. 1 (5), 594e599. https://doi.org/10.1001/ jamacardio.2016.1326 (The references list many studies on the importance of prevention.). Specter, M., 2017. Rewriting the code of life. New Yorker. January 2, 2017 http:// www.newyorker.com/magazine/2017/01/02/rewriting-the-code-of-life. Smuts, J.C., 1926. Holism and Evolution. MacMillan and Co, New York. Story, G., Berinato, S., 2014. Anticipating pain is worse than feeling it. Harvard business review. March 1. https://hbr.org/2014/03/anticipating-pain-is-worse-than-feeling-it. Sturman, D., Moghaddam, B., 2012. Striatum processes reward differently in adolescents versus adults. Proc. Natl. Acad. Sci. Unit. States Am. 109 (5), 1719e1724. http://www.pnas.org/content/109/5/1719.full. Thau, M., 2002. Consciousness and Cognition. Oxford University Press, Oxford. Topol, E., 2012. The Creative Destruction of Medicine: How the Digital Revolution Will Create Better Health Care. Basic Books, New York. Uexküll, T. von, 1997. Psychosomatic medicine. In: Adler, R. (Ed.). Lippincott Williams and Wilkins, Philadelphia. Vedantam, S., 2011. The national brain-damage league. Slate. January 18, 2011. http://www.slate.com/articles/health_and_science/the_hidden_brain/2011/01/ the_national_braindamage_league.html. Vijg, J., Campisi, J., 2008. Puzzles, promises and a cure for ageing. A realistic evaluation of our prospects for extending healthy life span in humans. Nature 454, 1065e1071. August 2008. https://www.nature.com/nature/journal/v454/ n7208/full/nature07216.html. Wallis, C., 2018. How fake surgery exposes useless treatments. Sci. Am. February 2018. Willyard, C., 2016. Timeline: regrowing the body. Nat. Outlook 540, S50eS51. https://doi.org/10.1038/540S50a. December 8, 2016. Wilson, F., 2016. Guilty Thing: a Life of Thomas De Quincey. Farrar, Strauss and Giroux, New York. Zadeh, L., 1965. Fuzzy sets. Inf. Control 8, 338e353.